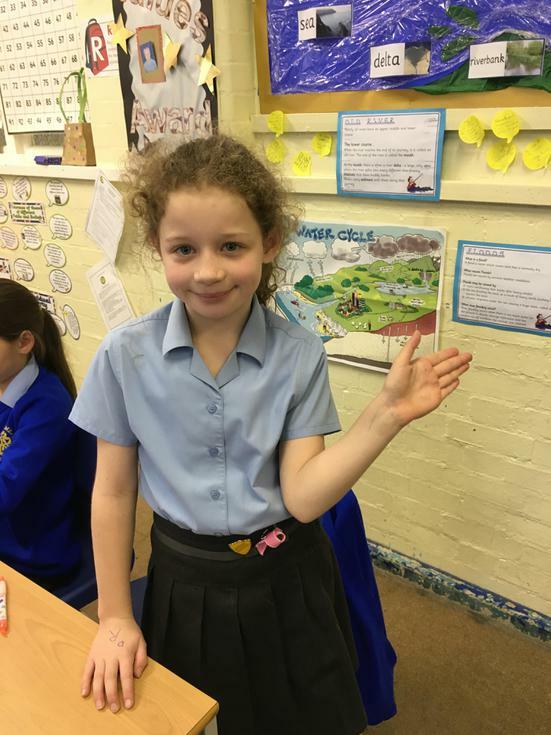 A huge well done to Molly, Marcy and Hannah on their well earned Principal's awards this half term. 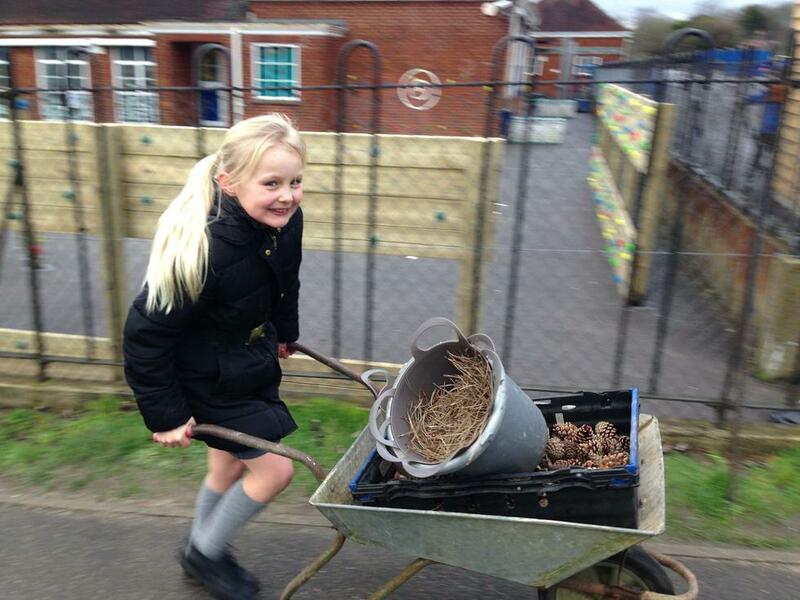 Thoroughly deserved. 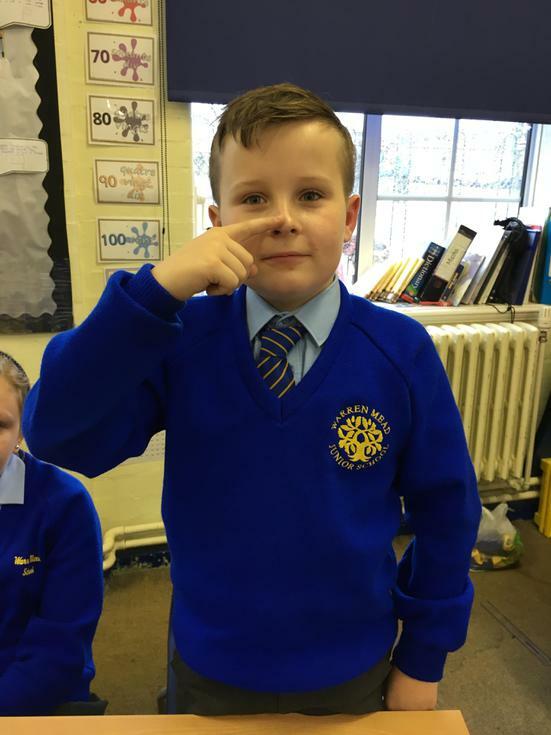 A huge well done to Jack G, Kieran and Evie on their well earned Principal's awards this half term. 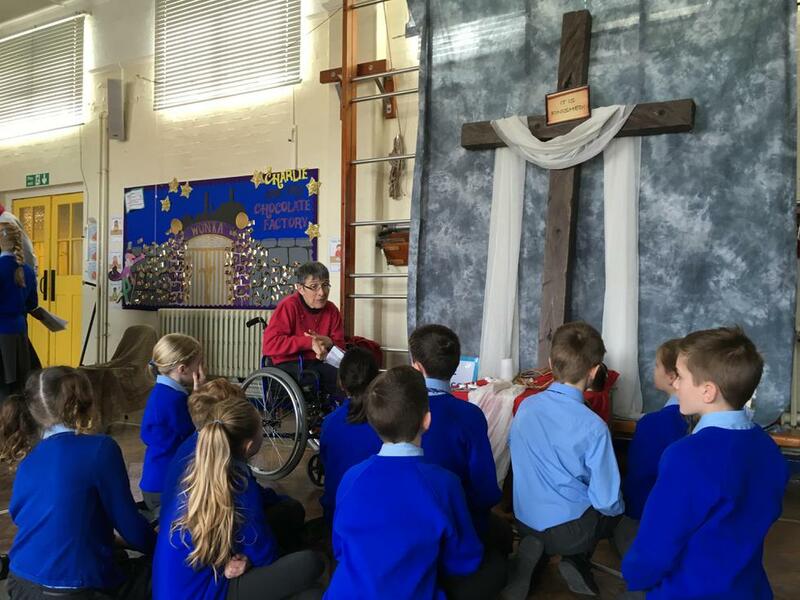 Thoroughly deserved. 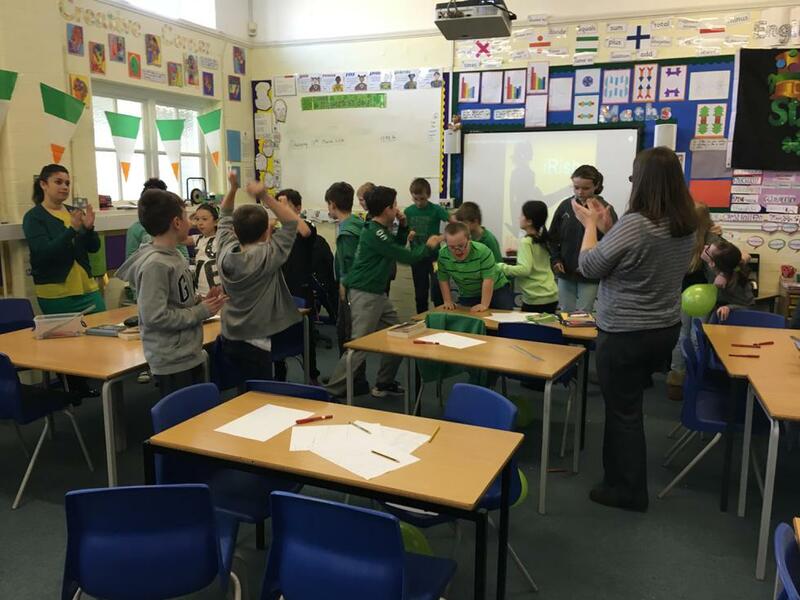 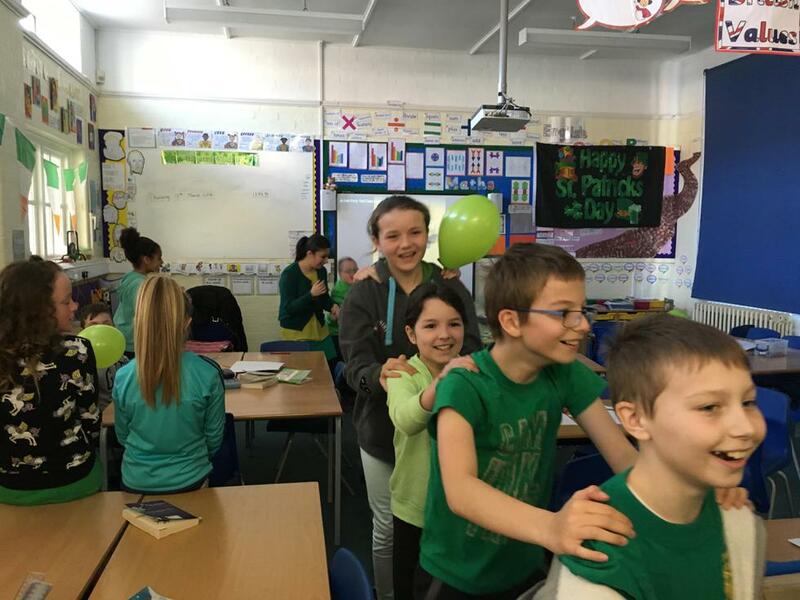 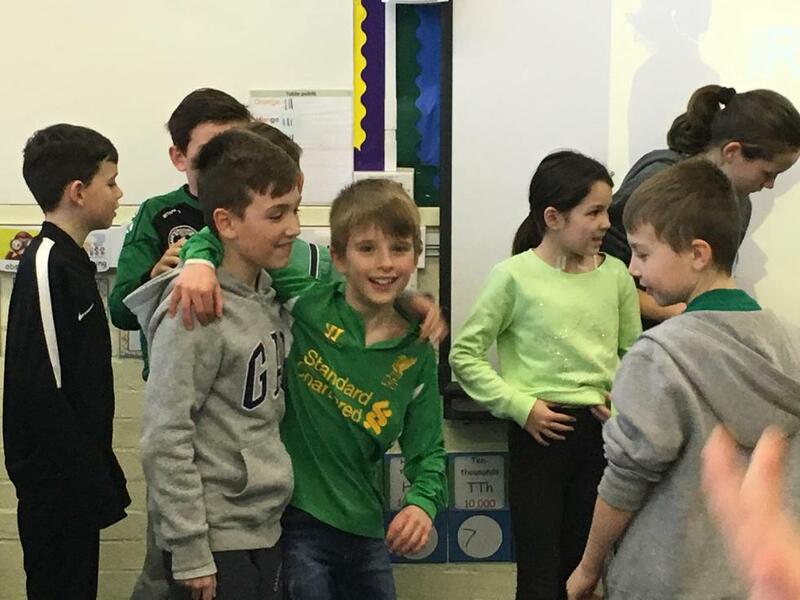 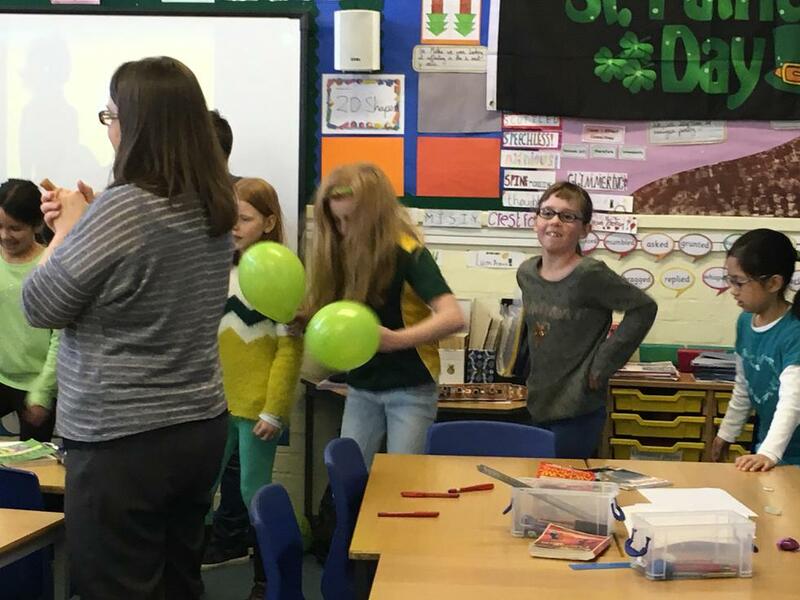 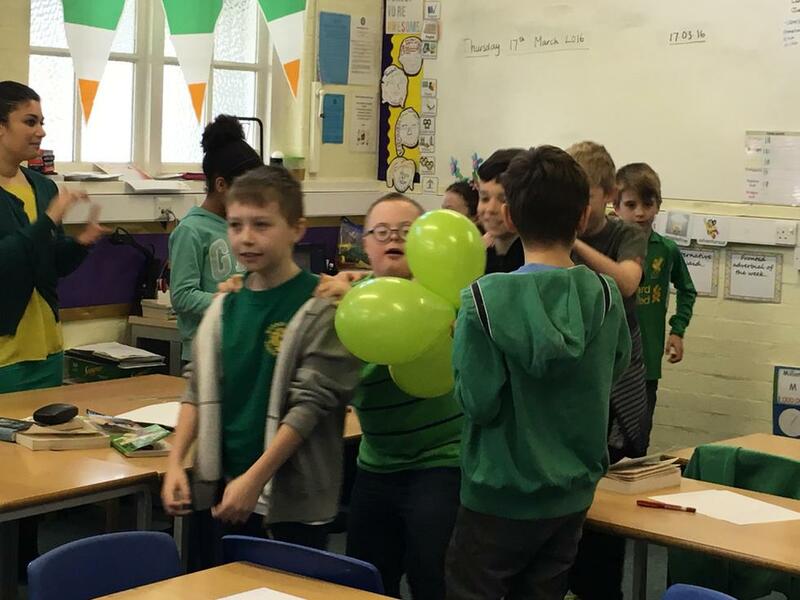 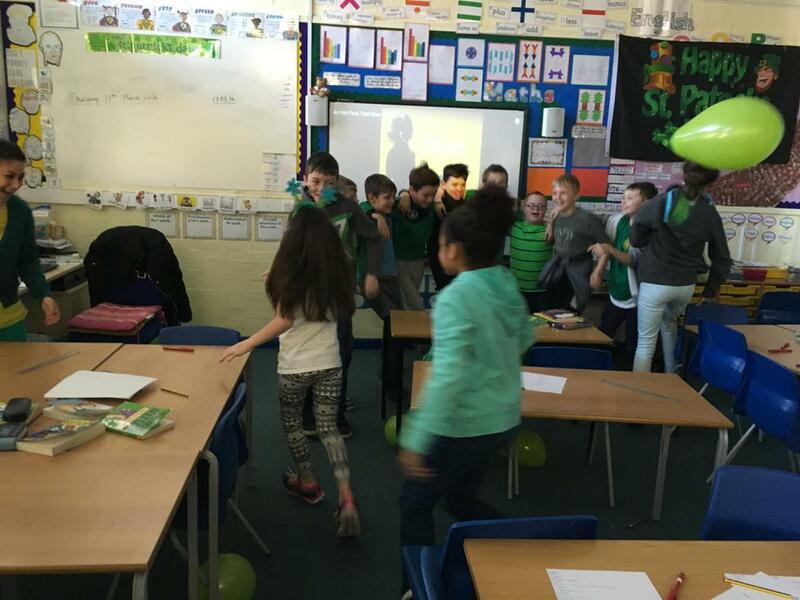 To enhance our learning about the Emerald Isle, Year 5 took full part in the celebrations of St Patrick's Day. 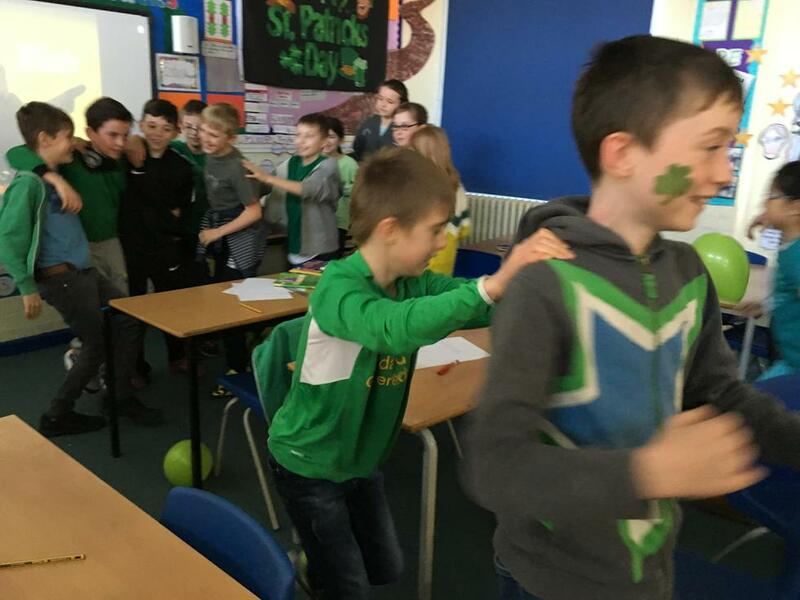 We jigged, we sang, we learned about the history of St Patrick and we got dressed up in green. 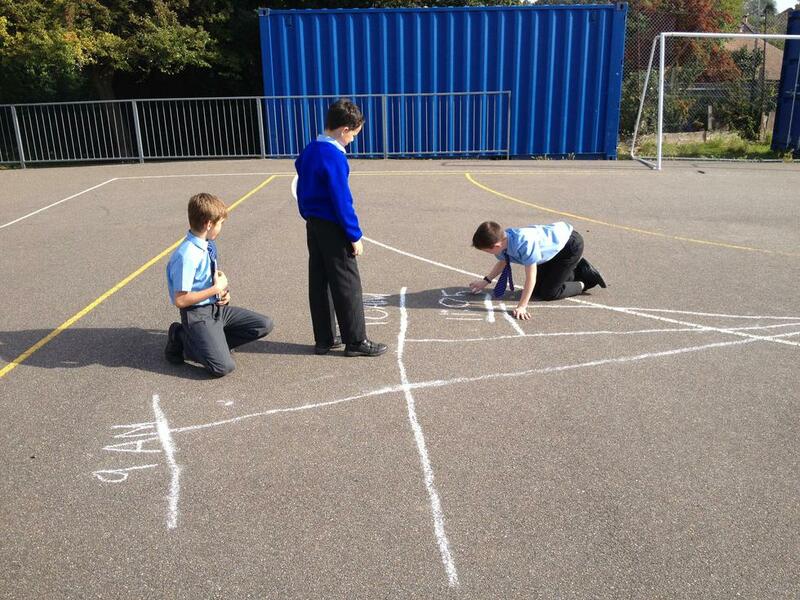 A good way to engage even more with our learning. 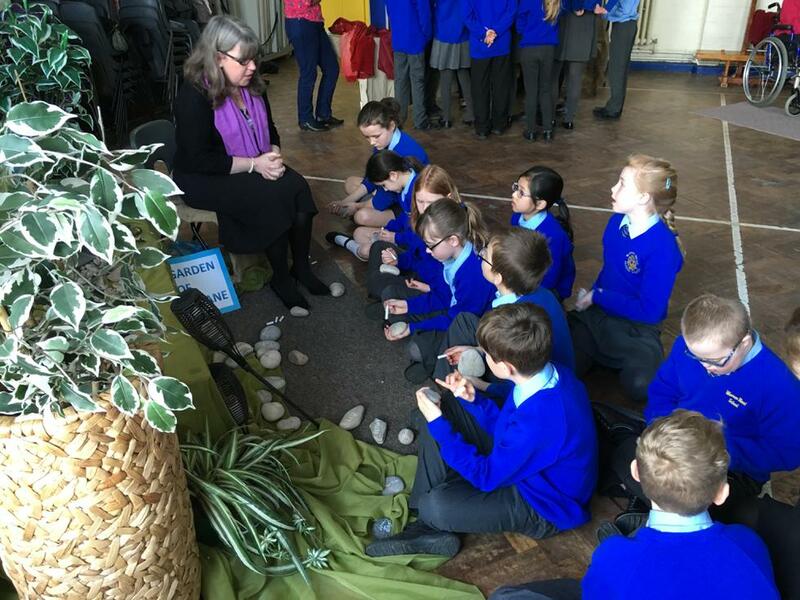 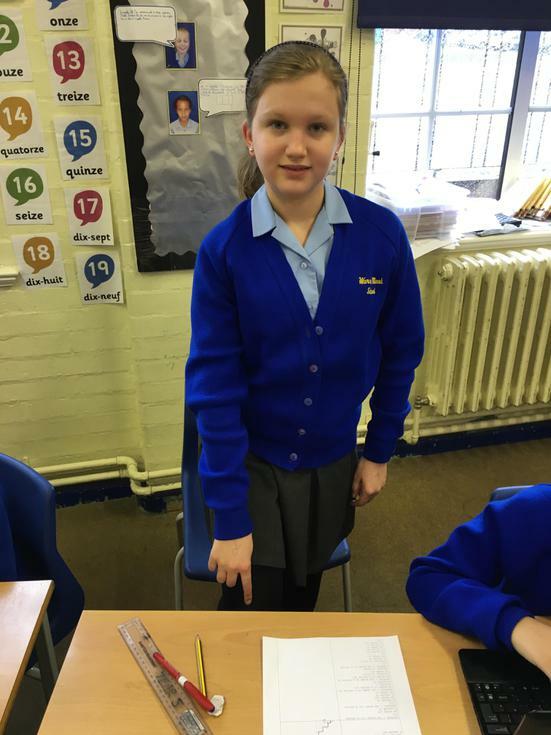 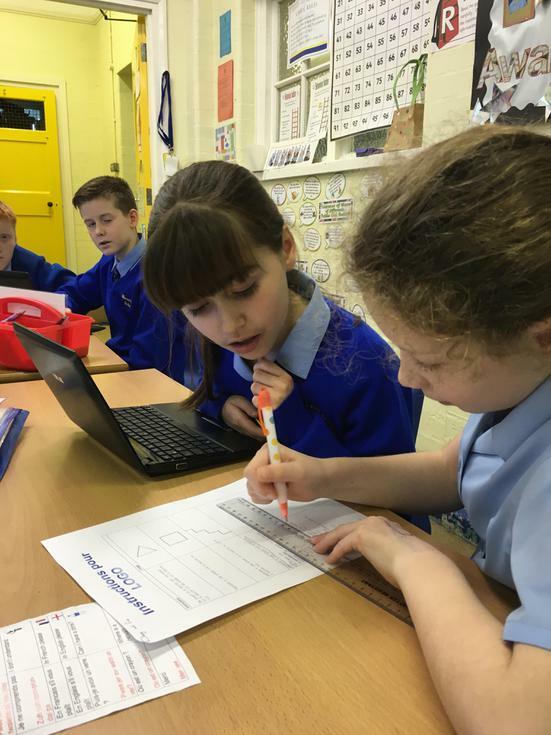 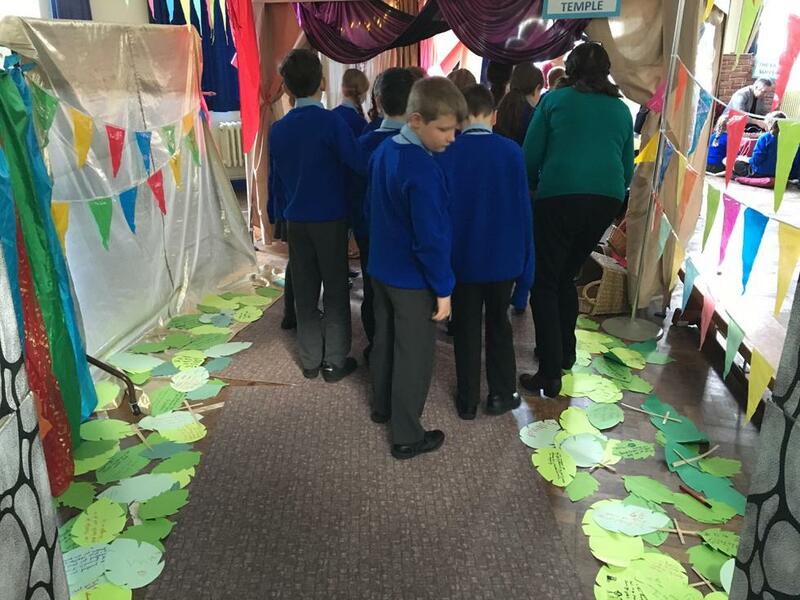 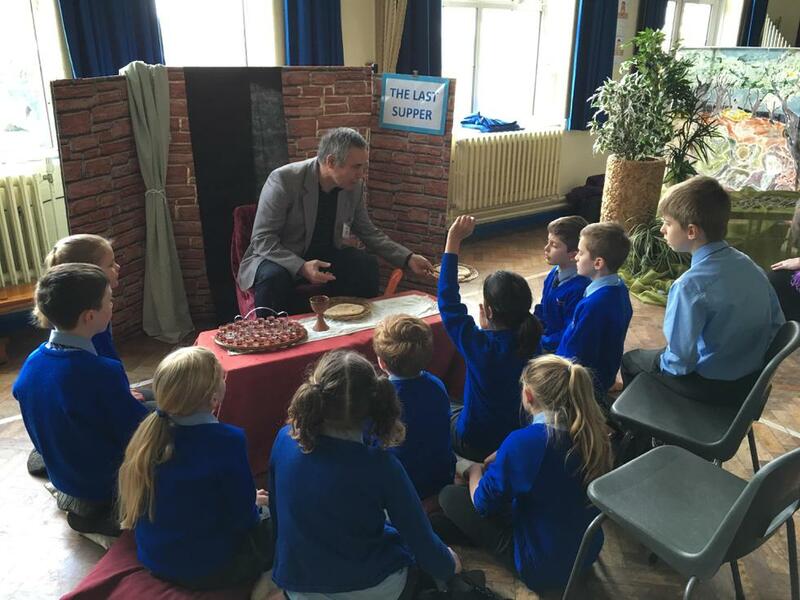 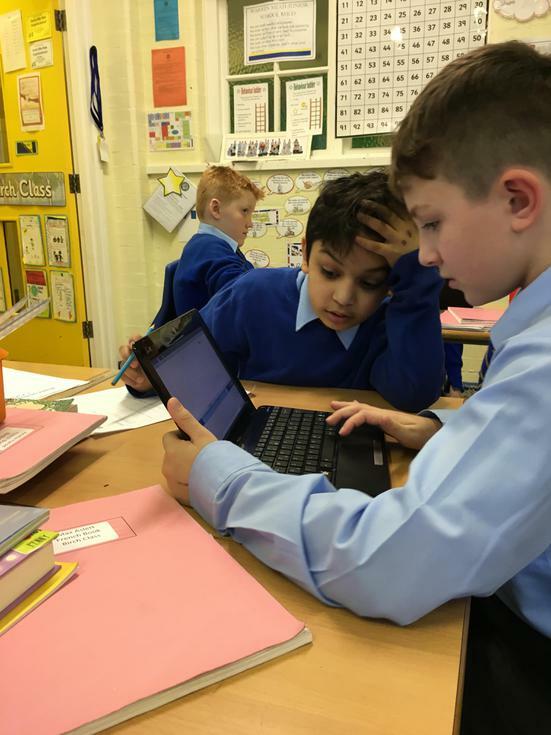 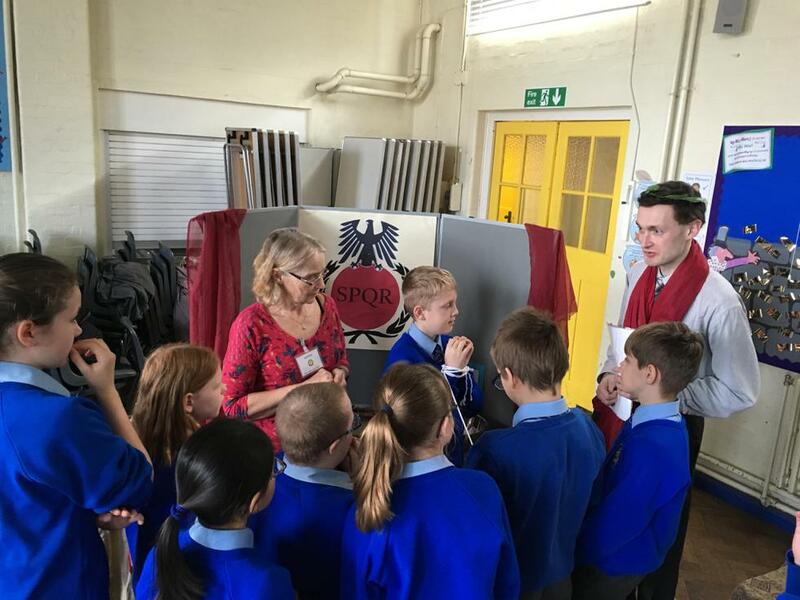 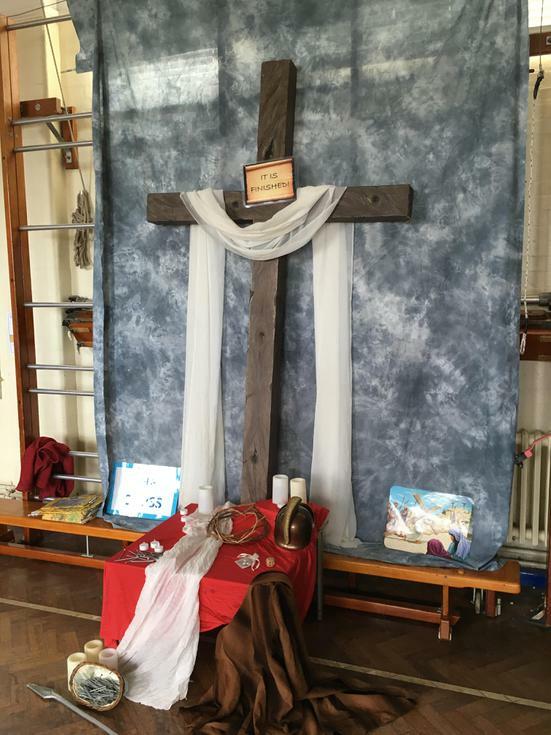 The children got to take their learning of the Easter story to a whole new level recently in Year 5 thanks to Spinnaker. 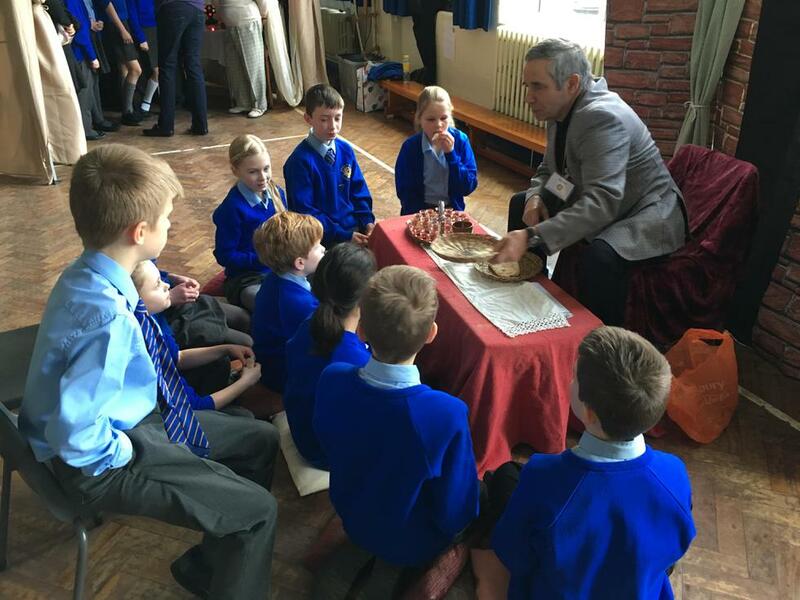 The children entered Jerusalem, broke bread and drank 'wine' as they did at the last supper, witnessed the trial of Jesus and entered the empty tomb. 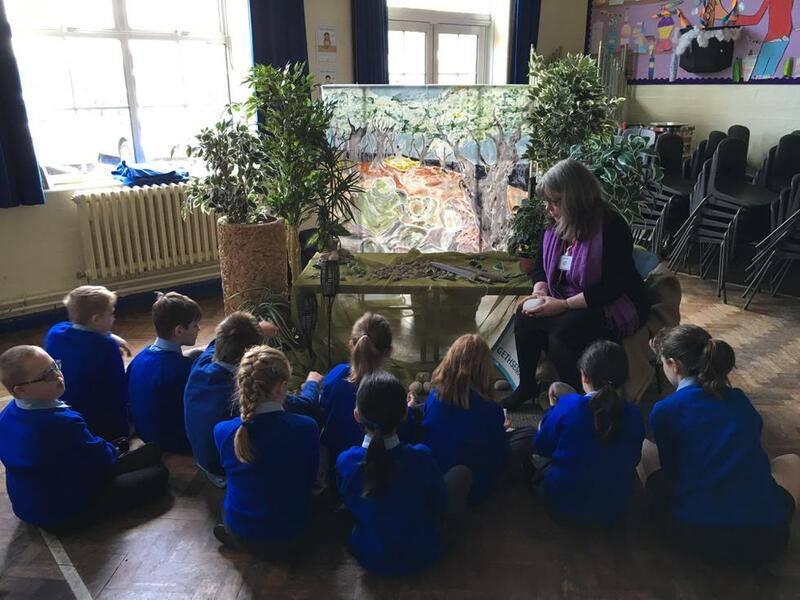 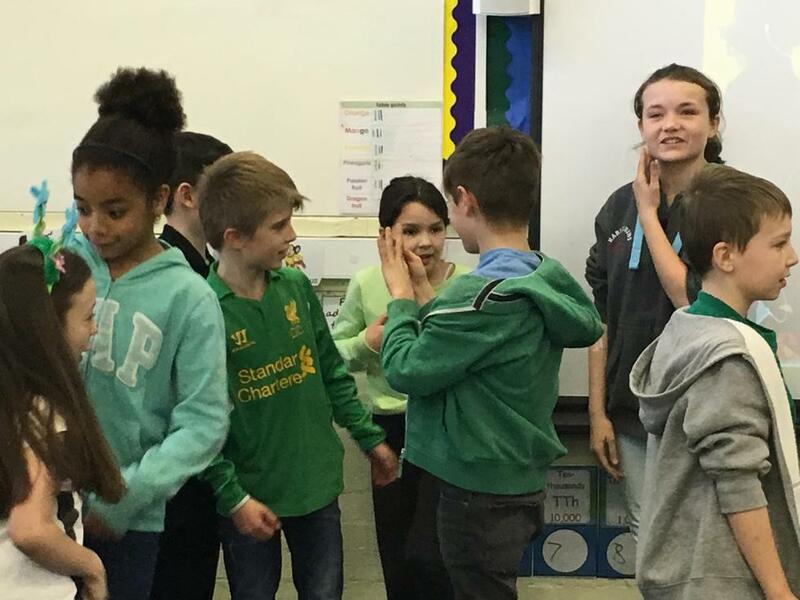 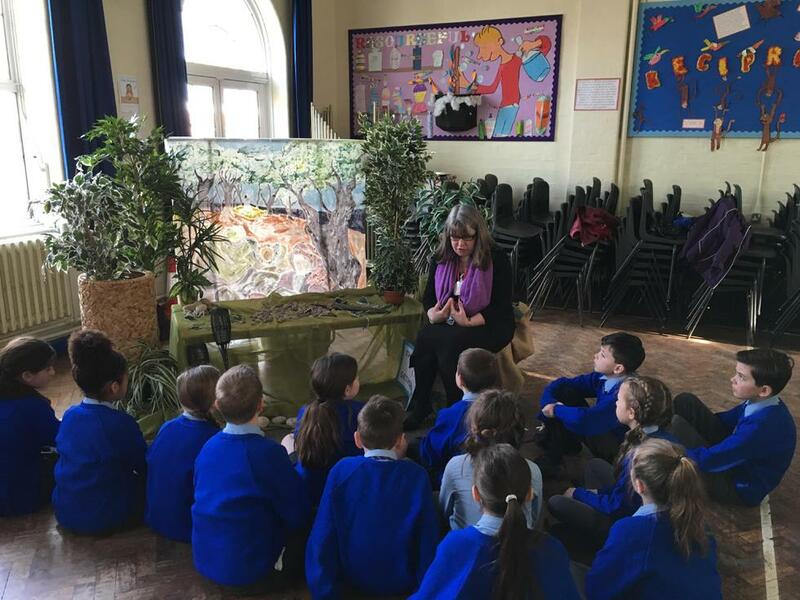 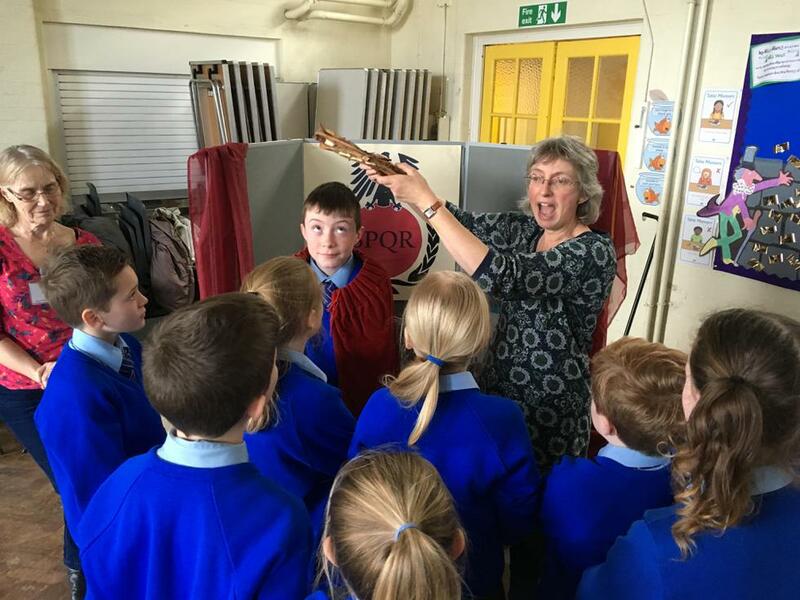 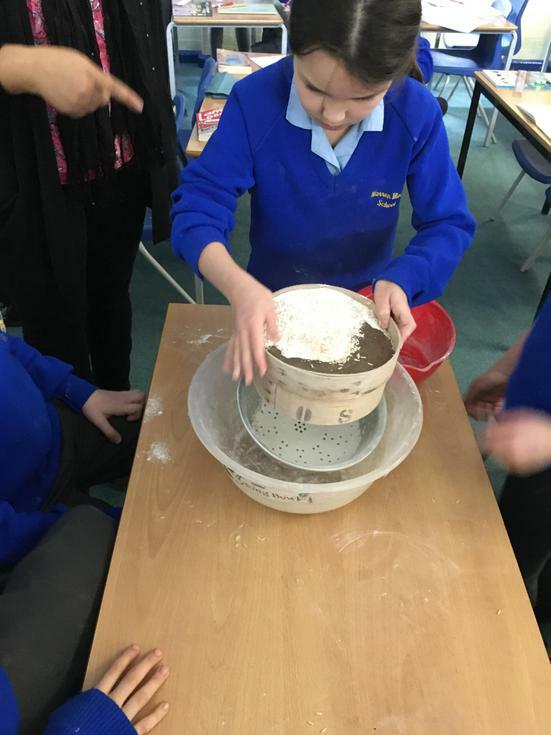 Bringing the story to life like this really helped the children engage with their learning and gave them a much better understanding of the emotions involved. 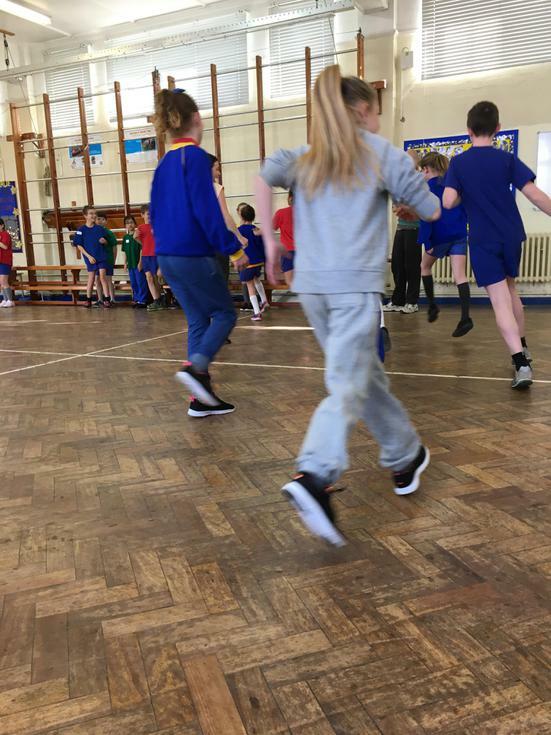 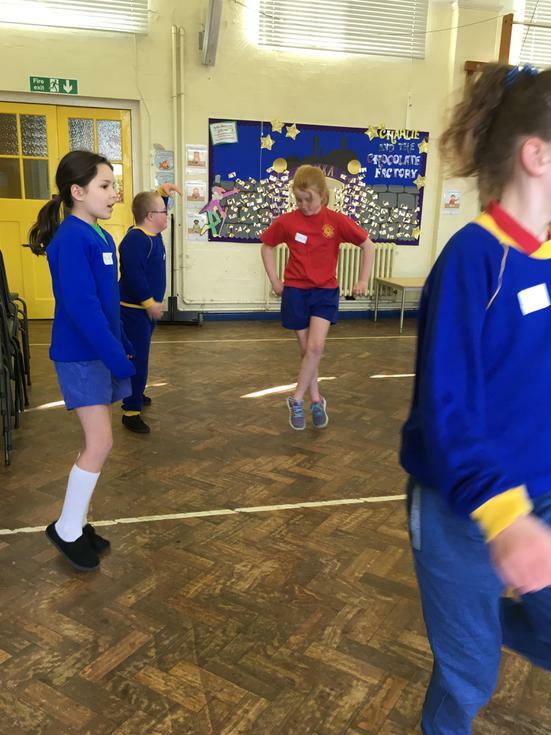 Look up grace in the dictionary and you'll see pictures of Year 5 learning their Irish dancing; less so Mr Jackson. 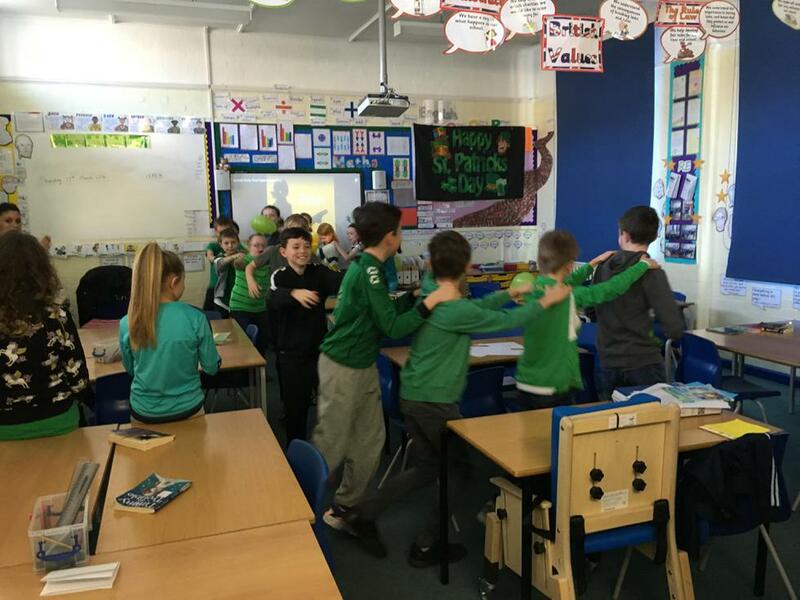 As part of our topic looking at the Emerald Isle, we have taken on the task of becoming Irish dancers. 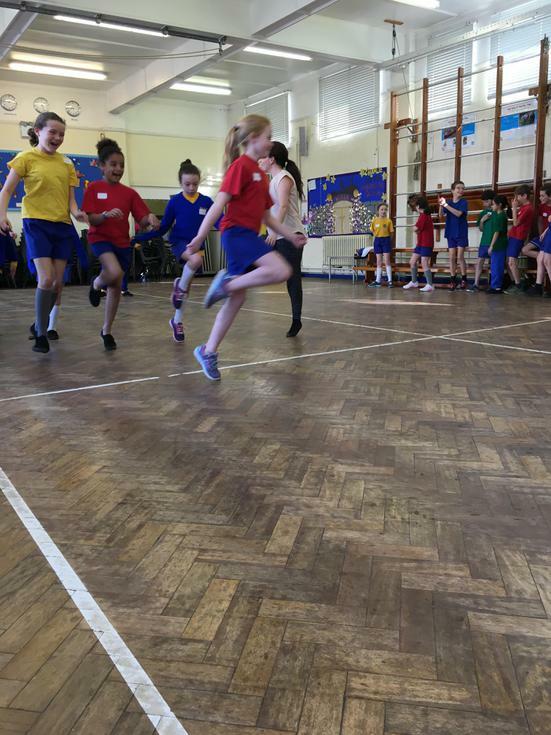 It will take all of our powers of determination, focus and resilience but we in Year 5 love nothing more that something that stretches and challenges us. 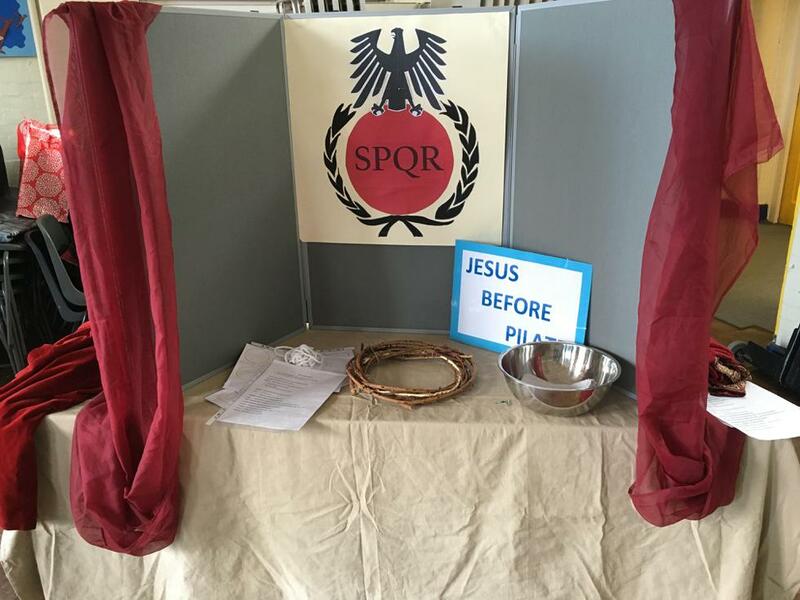 We'll keep you posted. 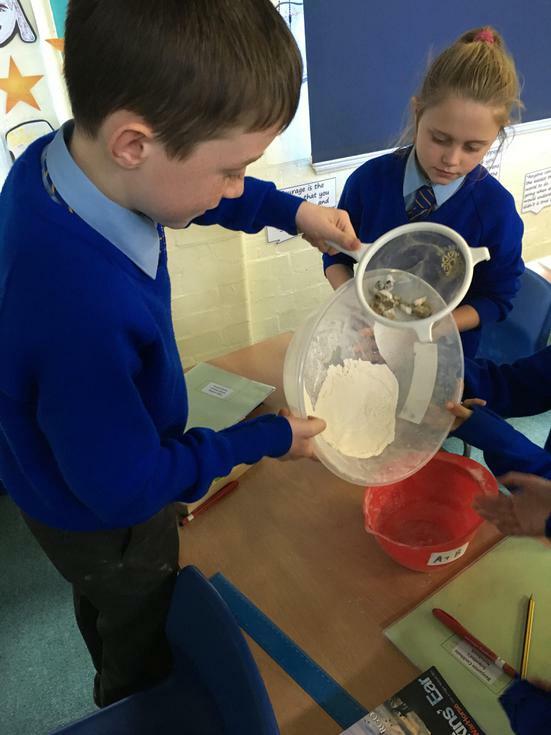 As scientists, Year 5 have been looking at different ways we can separate mixtures. 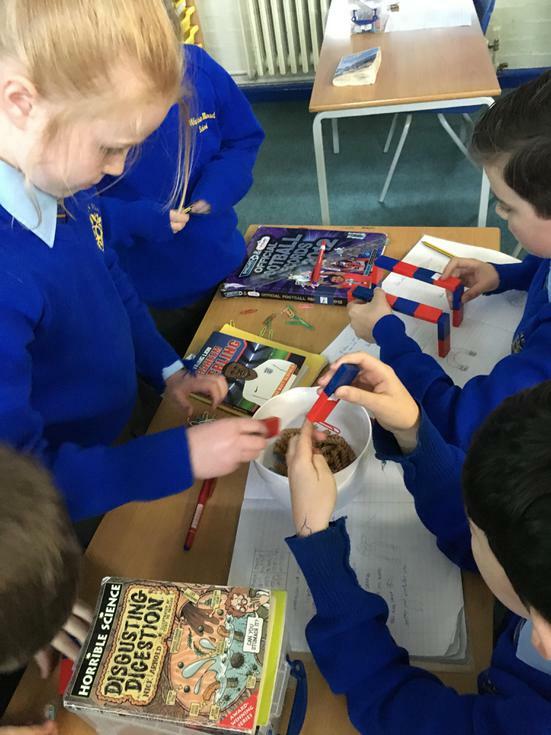 We thought about how to separate a variety of materials that had been mixed up as well as separating more complicated solutions. 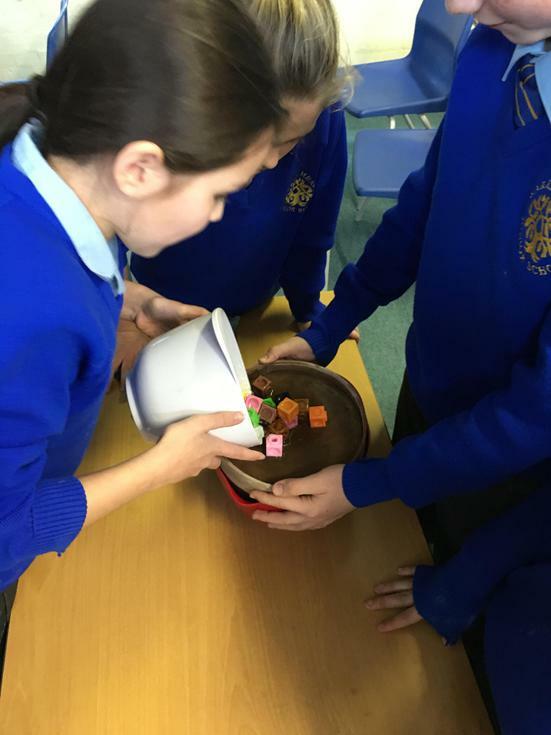 Together, we discovered that sometimes you need magnets, sometimes you need sieves and sometimes you need to evaporate away the water. 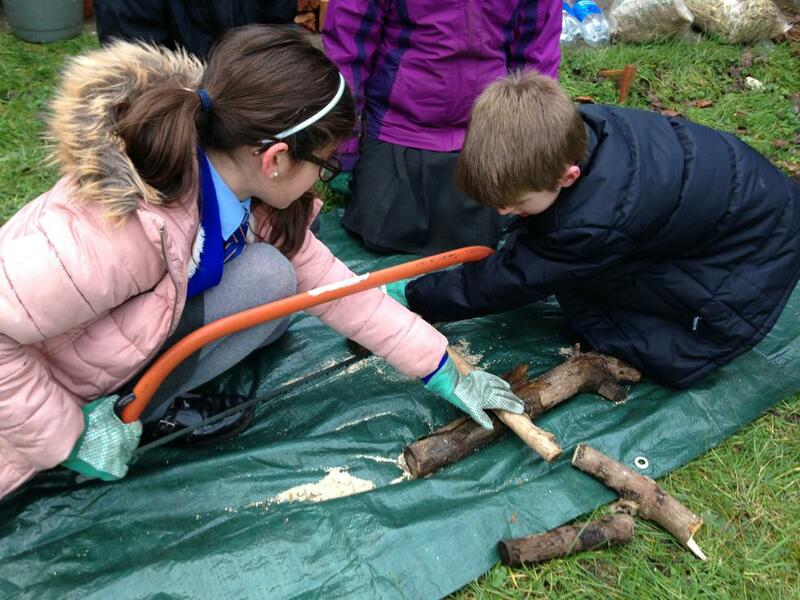 Though our filtering seemed to clear up our muddy water a bit, we wouldn't be the first in line to drink it. 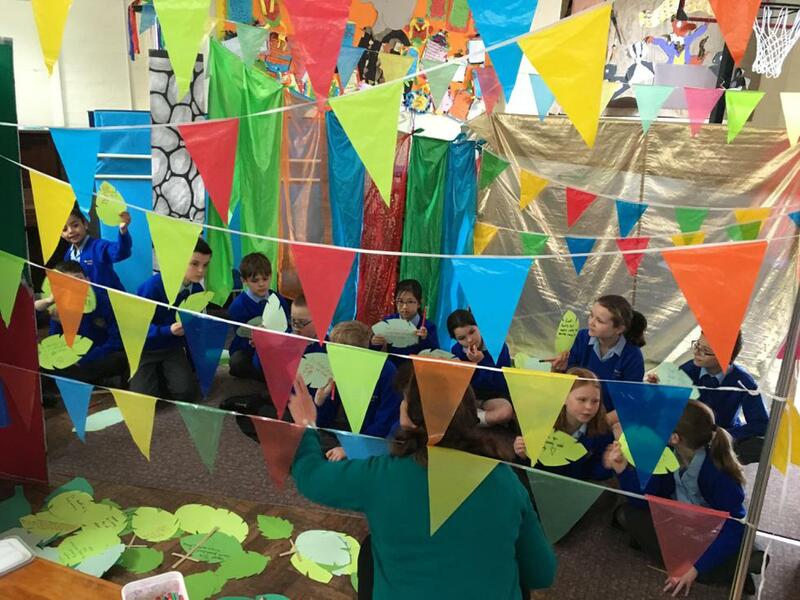 Thankfully Bough Beech will be visiting us shortly to go through some of the more vigorous steps they take to ensure clean drinking water for all. 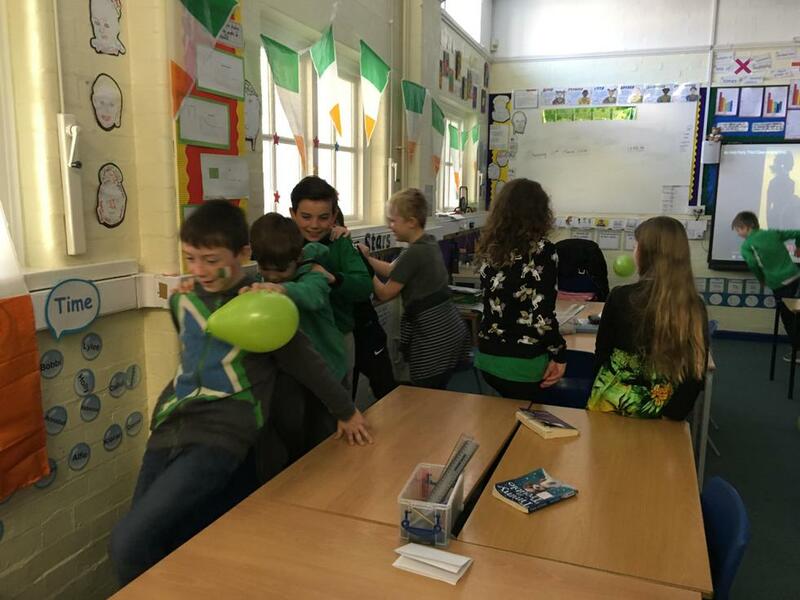 To those who have requested, here are the answers to the World Book Day Quiz. 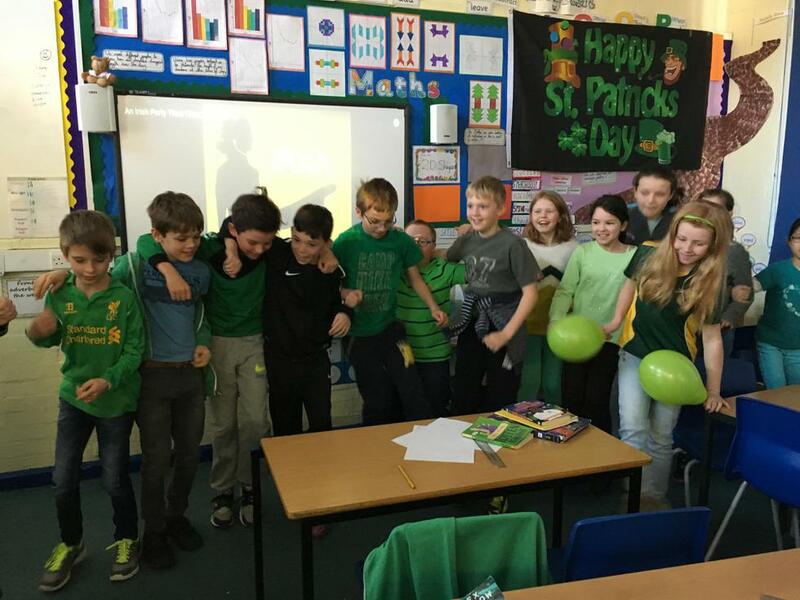 There was an error with number 31 but well done to those who still managed to get the answer regardless. 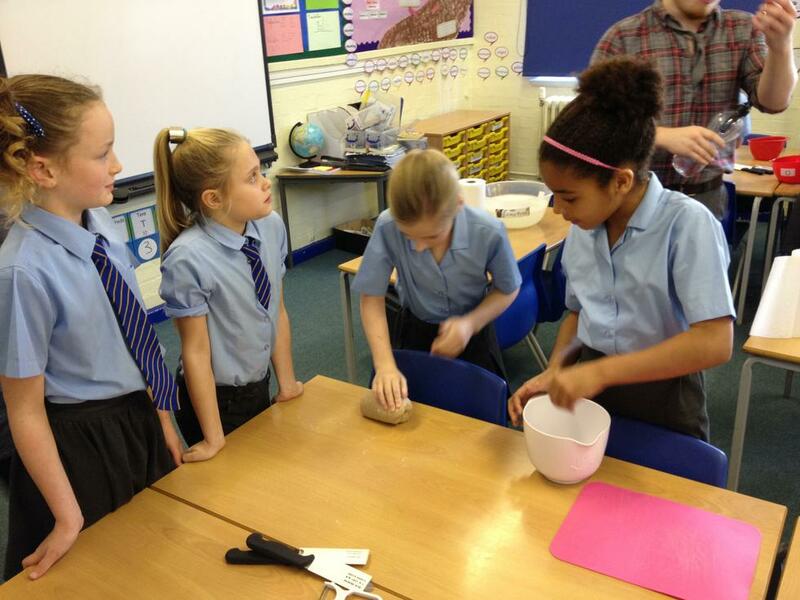 A huge well done to Annabel, Ellen and Ruby B on their well earned Principal's awards this half term. 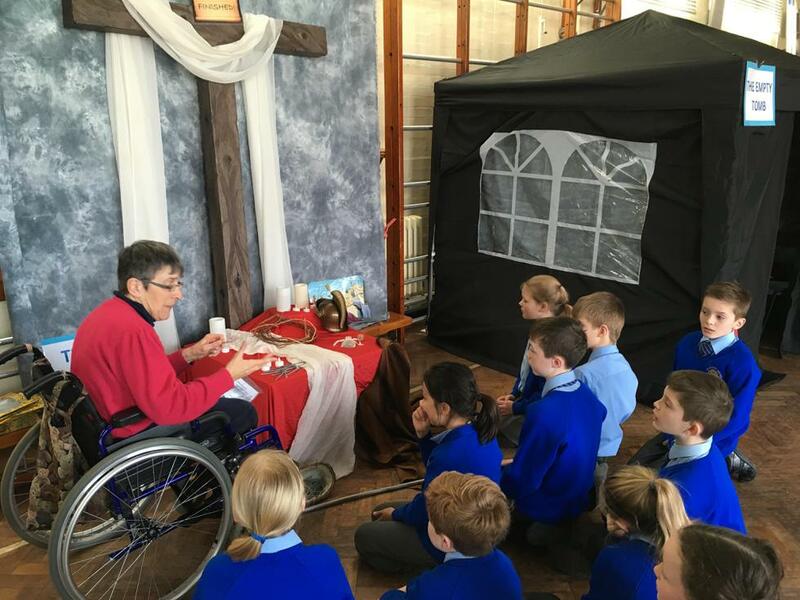 Thoroughly deserved. 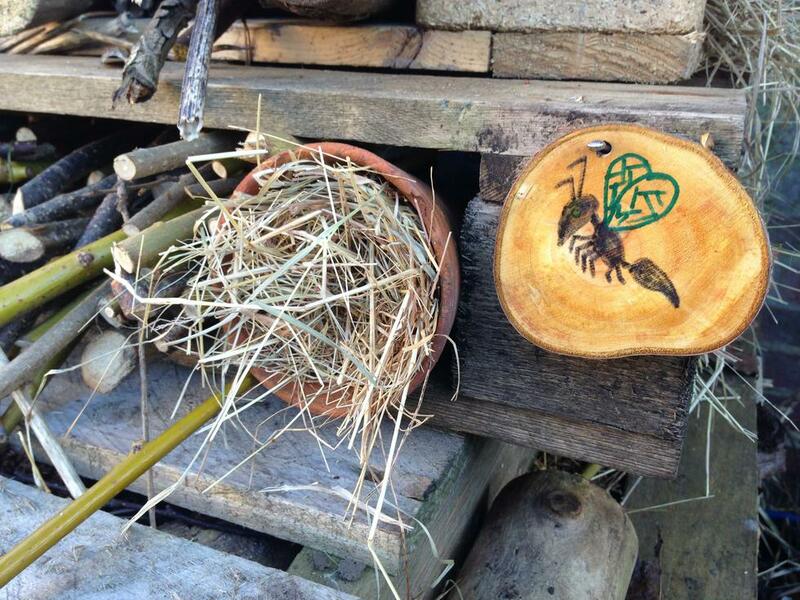 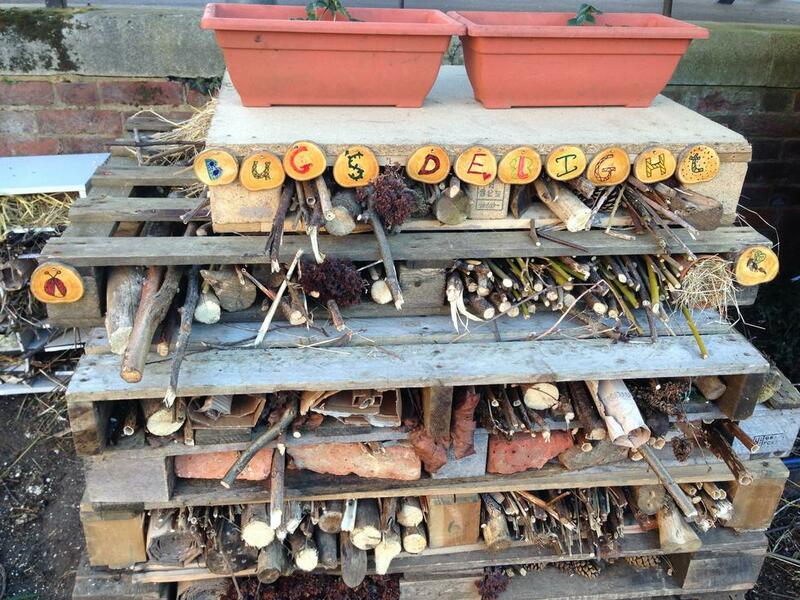 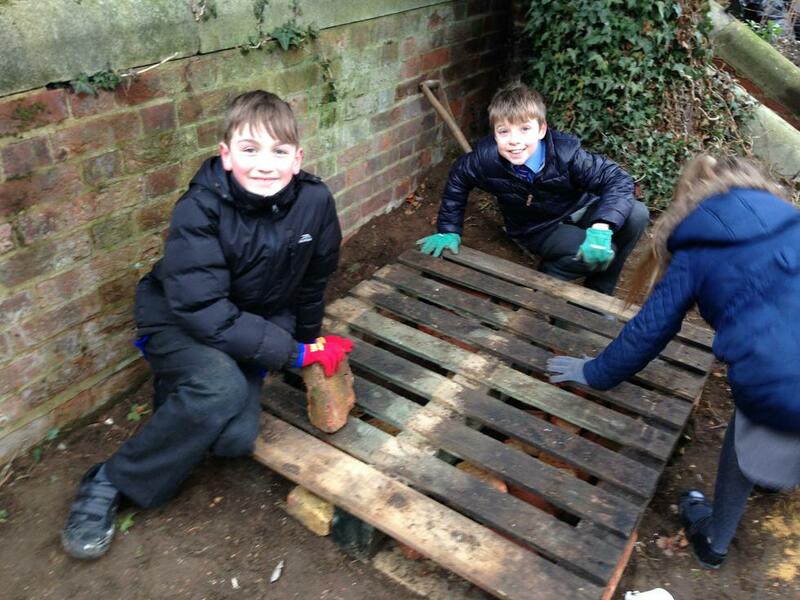 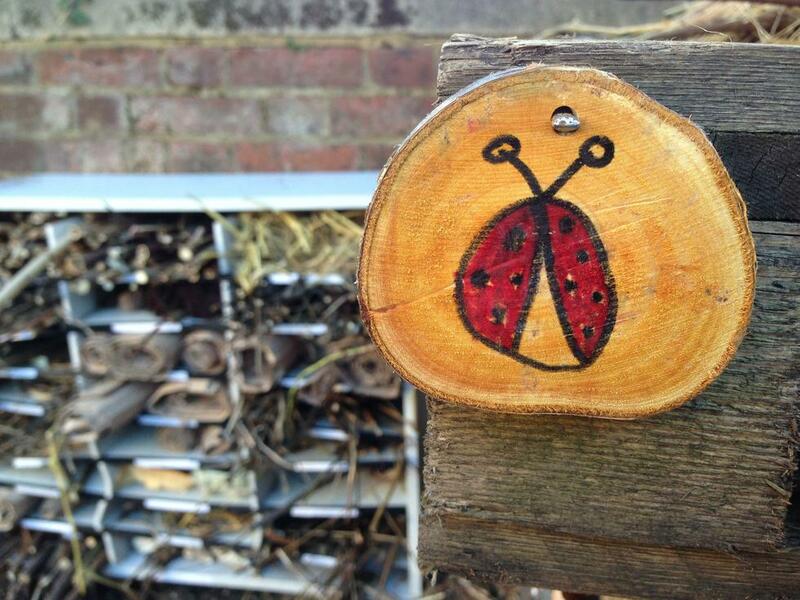 After all the hard work, cold feet and muddy hands, Year 5 are pleased to unveil our completed bug hotel. 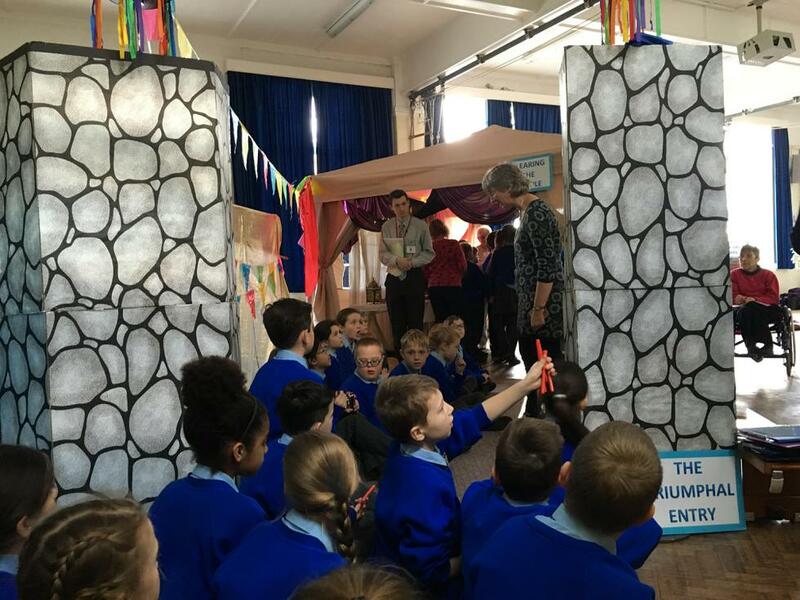 Again no giant scissors for the opening but it was suitably grand nonetheless. 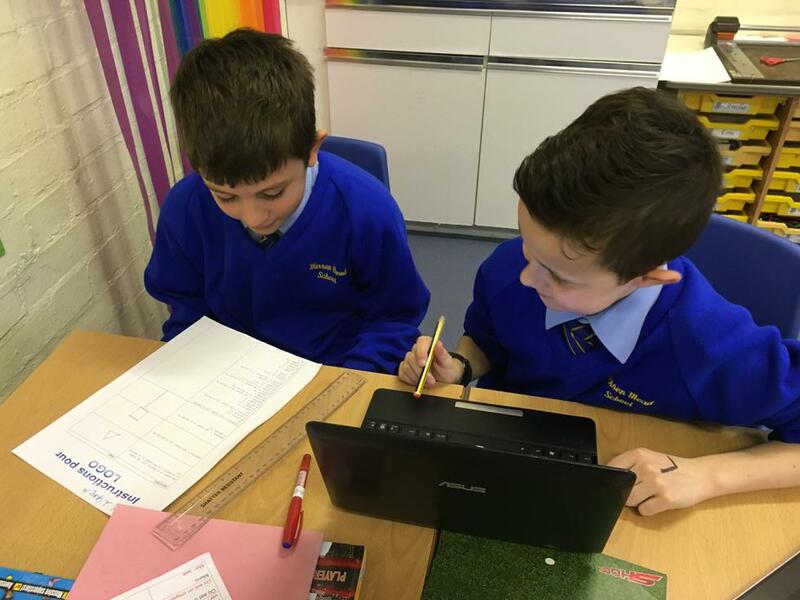 We look forward to watching the clients check in and seeing what we can learn about them. 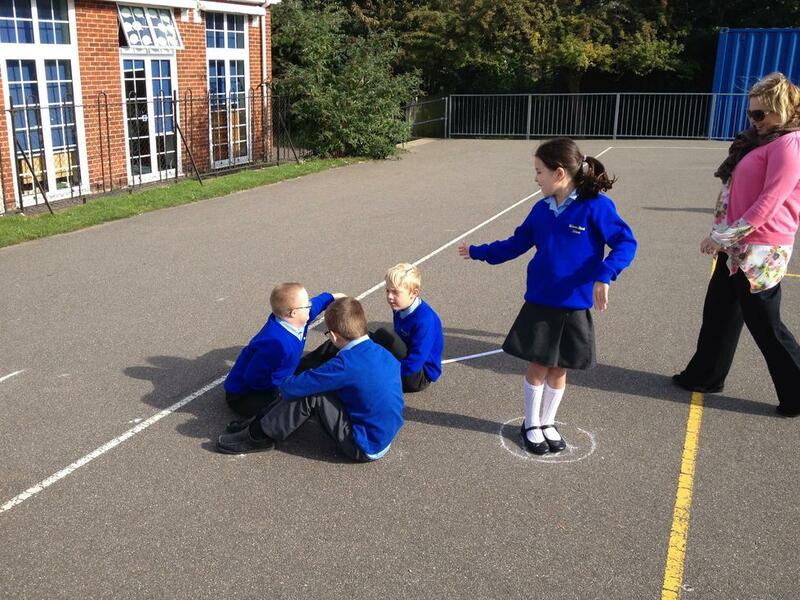 Les directions dans la ville! 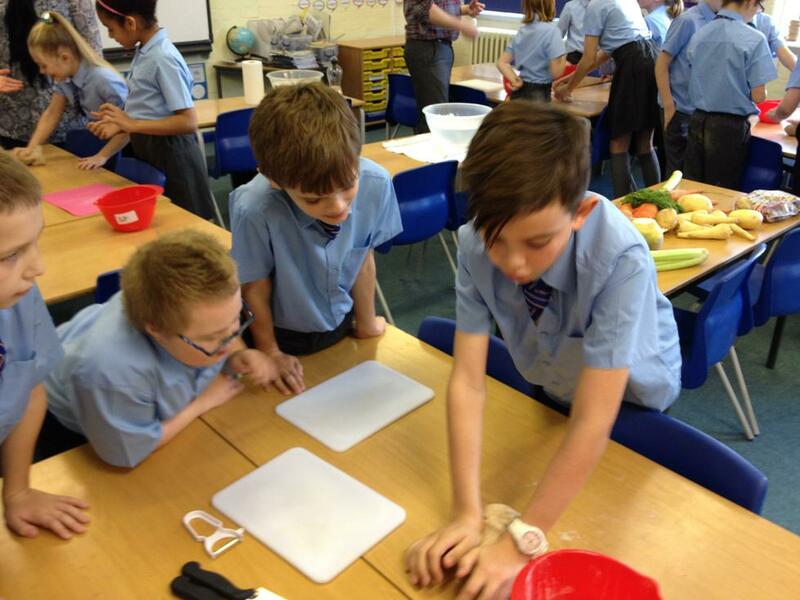 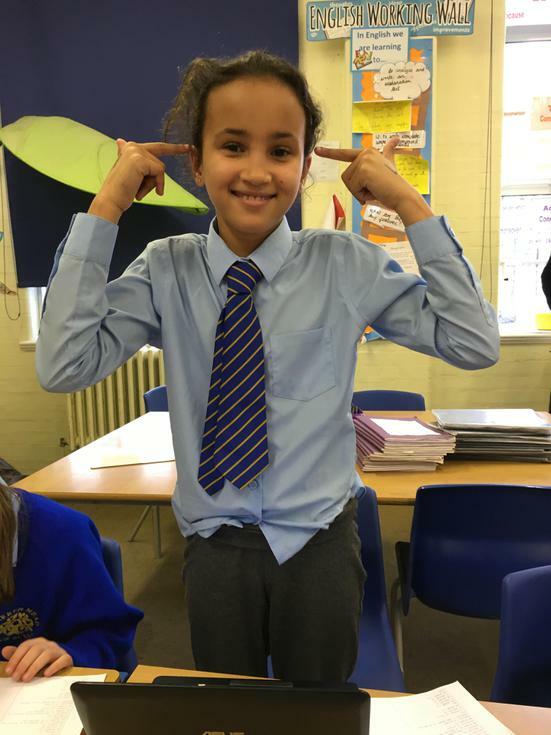 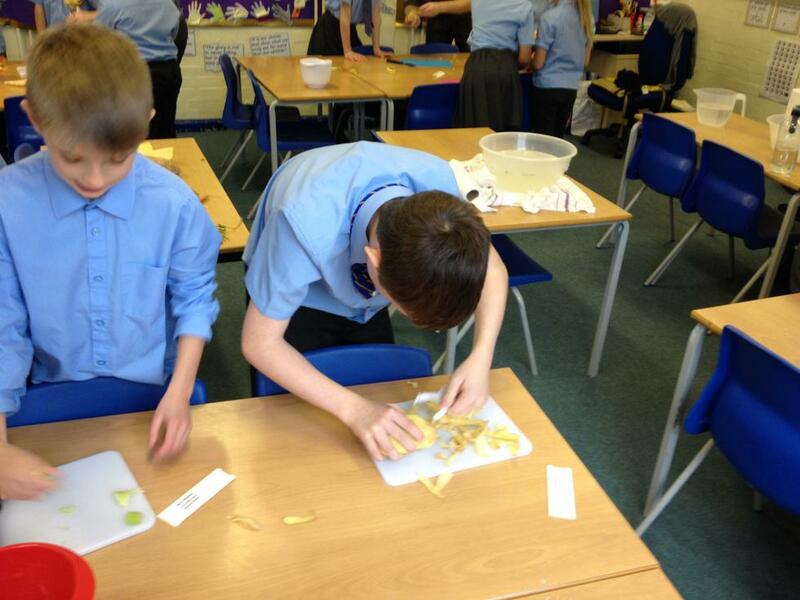 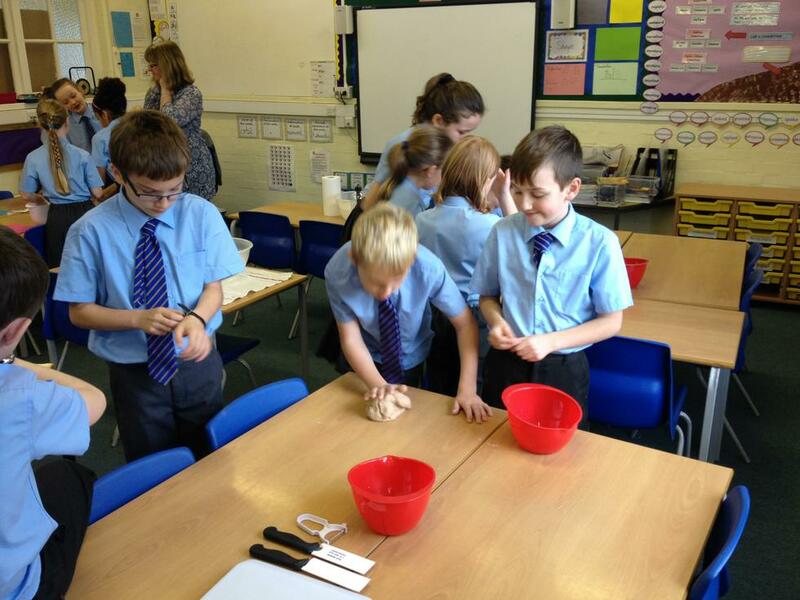 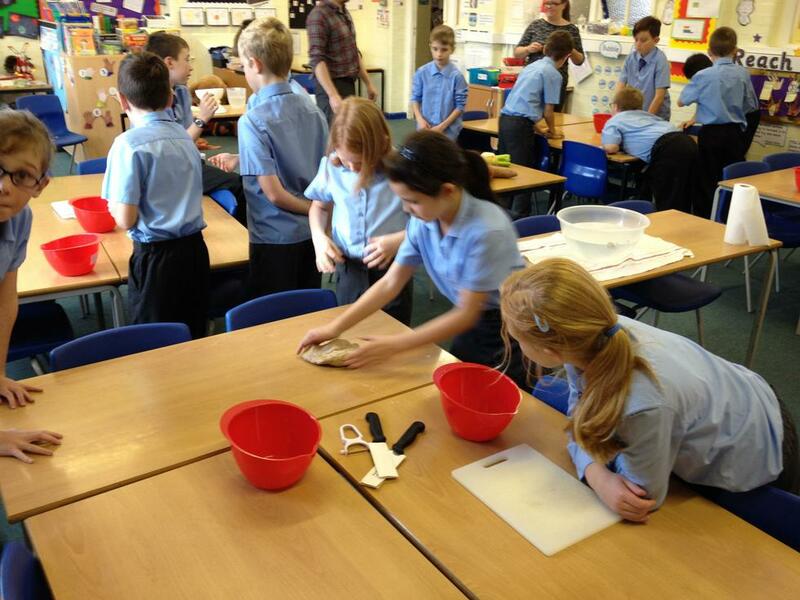 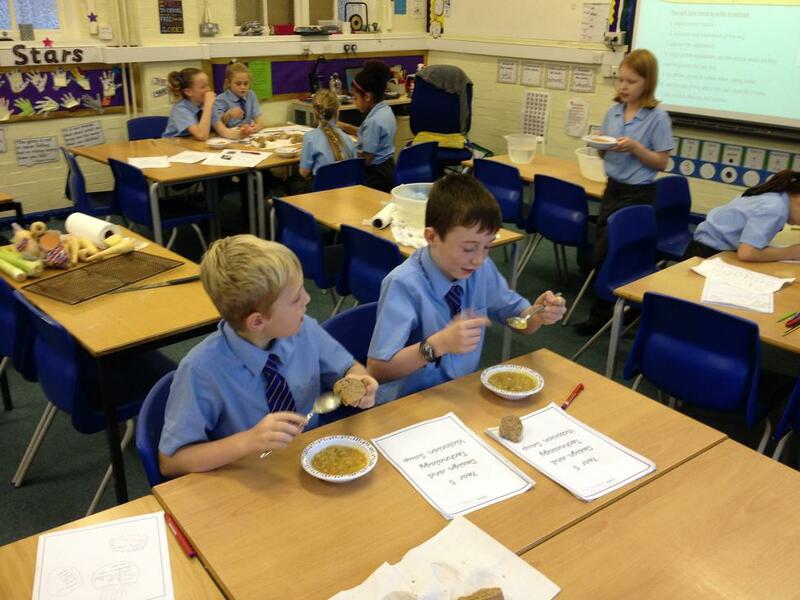 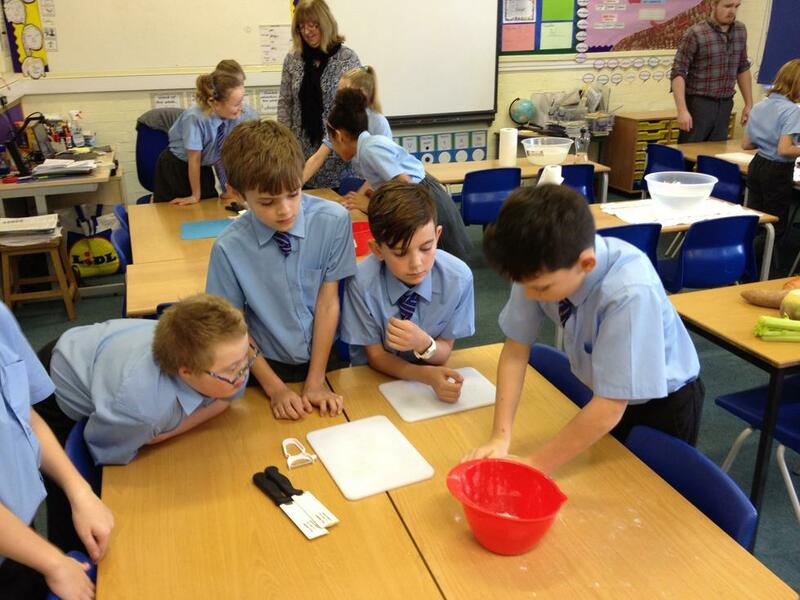 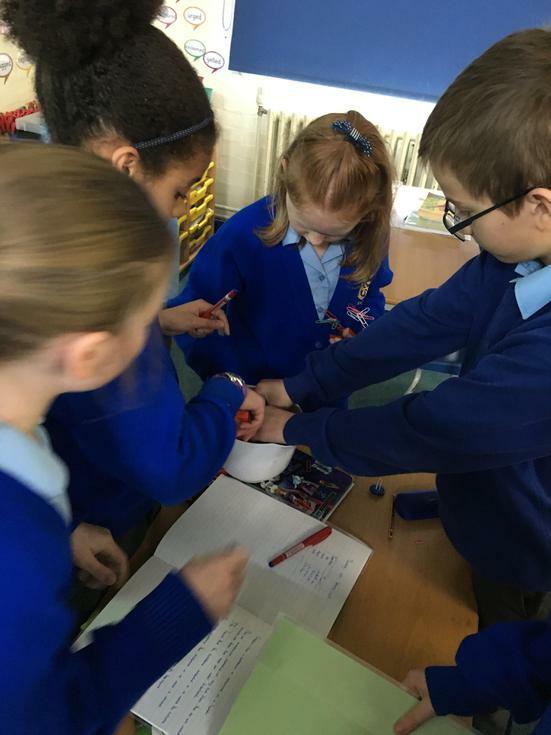 This half term each Year 5 class had a French day in order to learn directions in French. 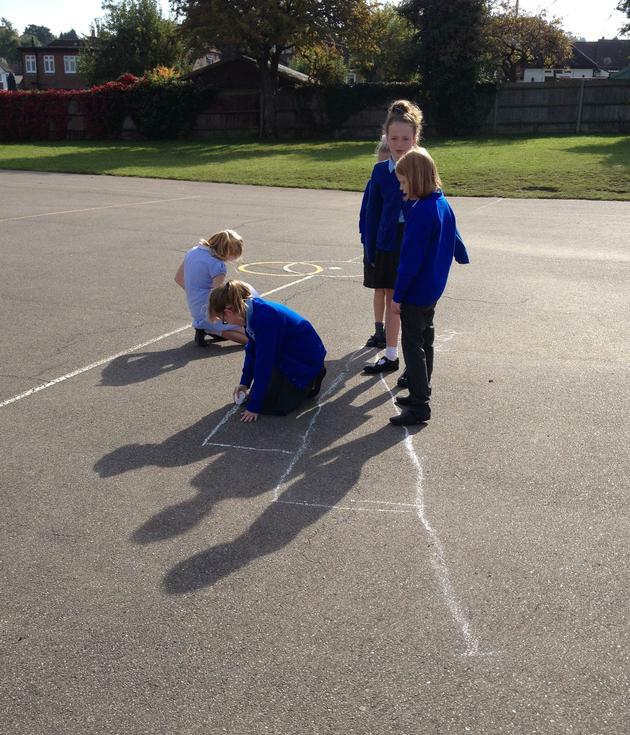 We used Logo to practise our directions and then wrote directions to different places within a town. 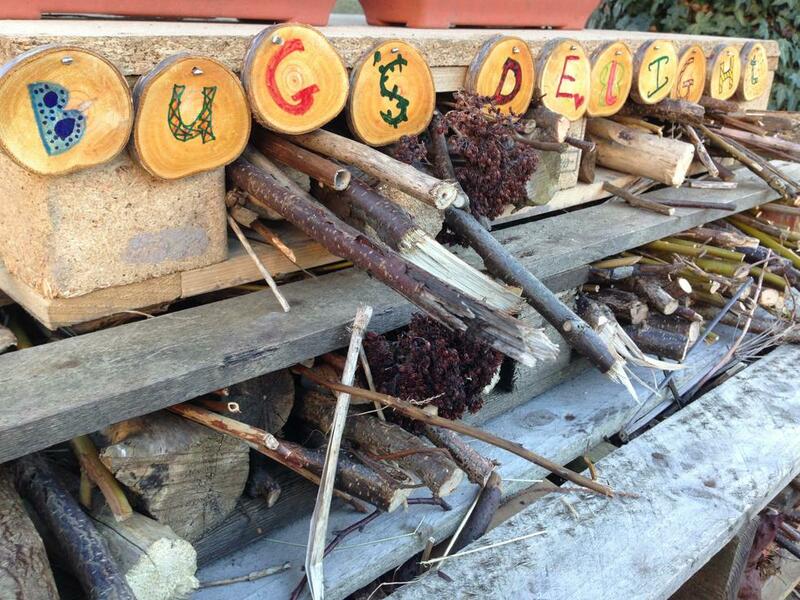 Fantastique! 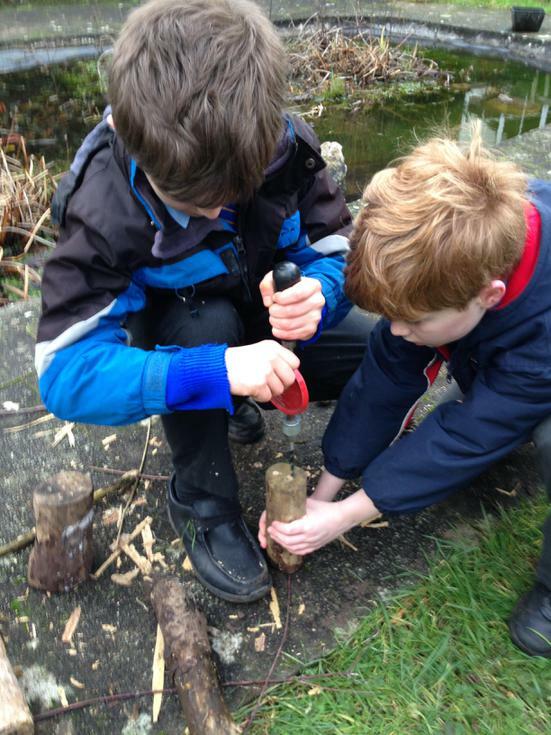 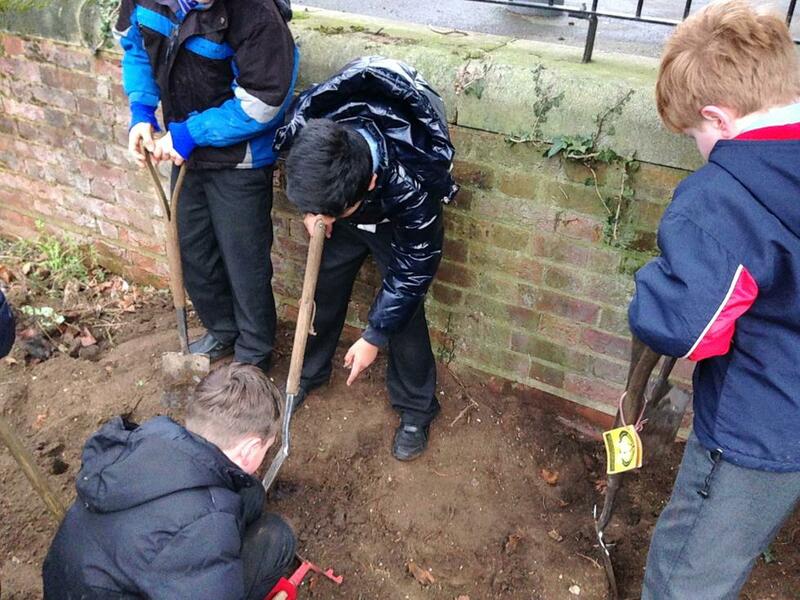 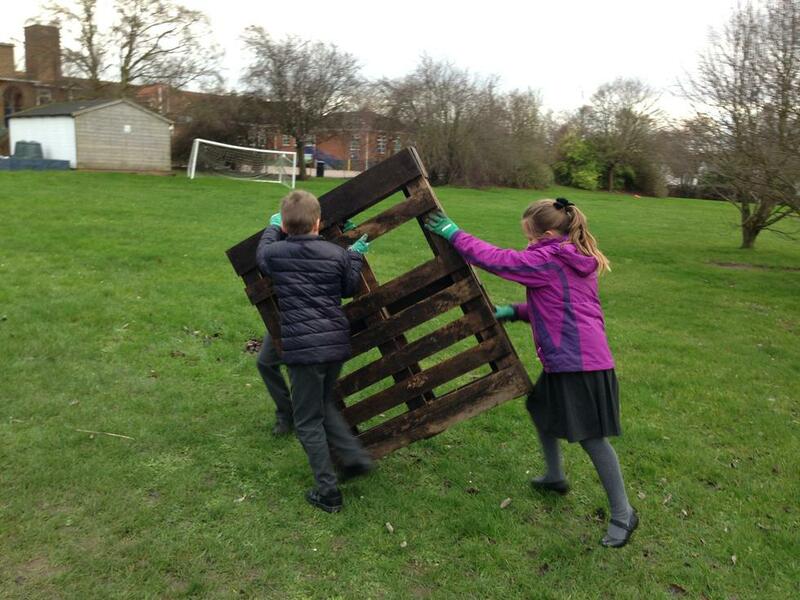 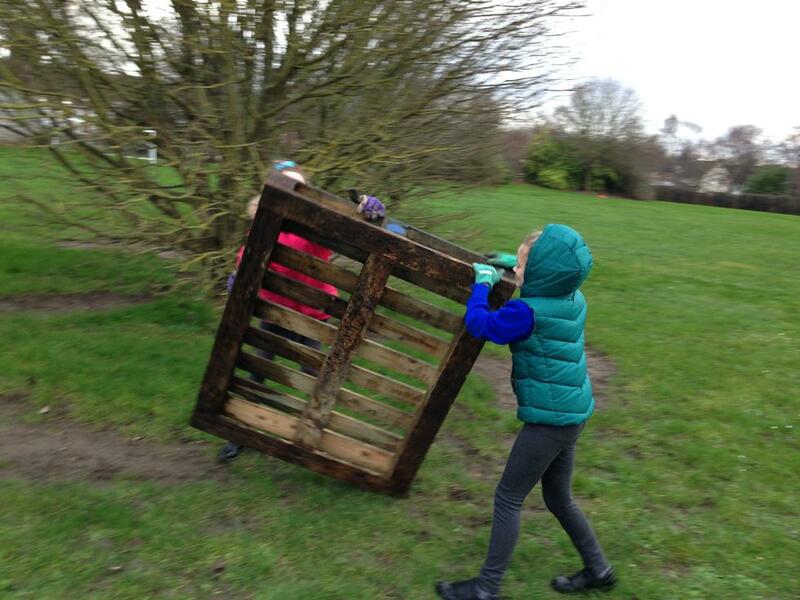 Year 5 are lucky to be able to take our learning outside again this half term (despite the cold). 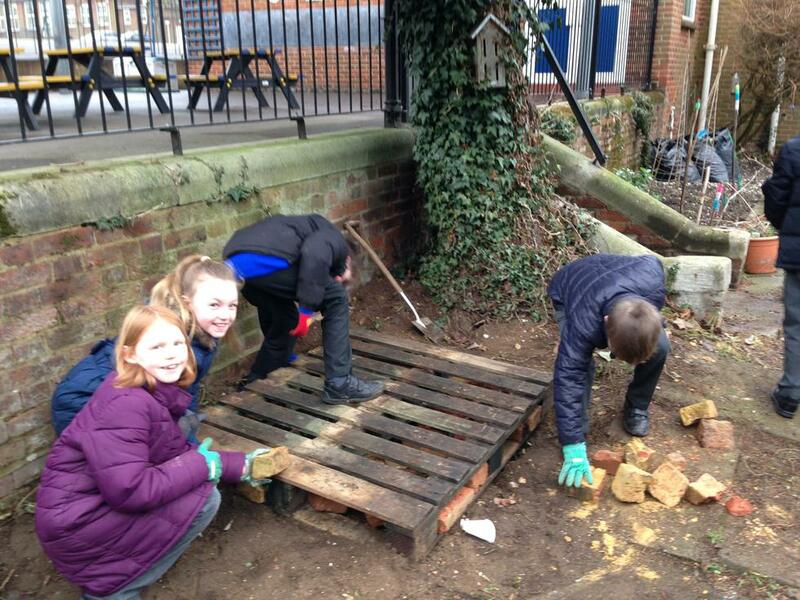 To go along with our topic of life-cycles, we are investigating the different habitats that exist in our outdoor area and trying to create some habitats of our own. 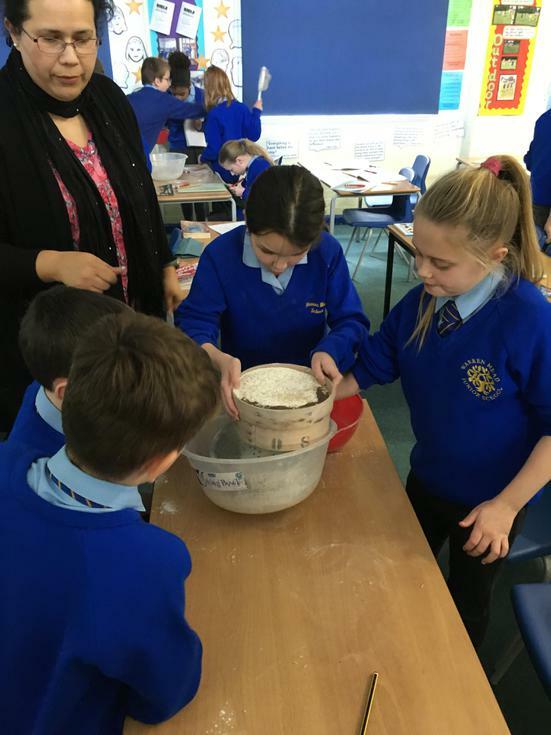 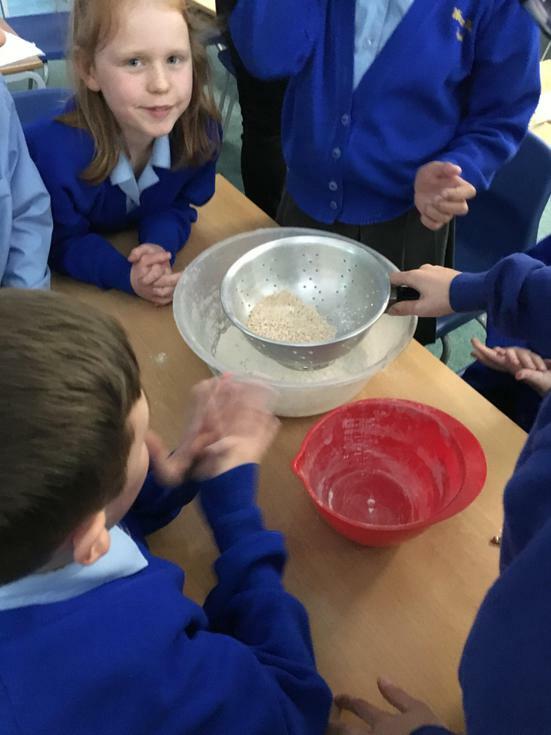 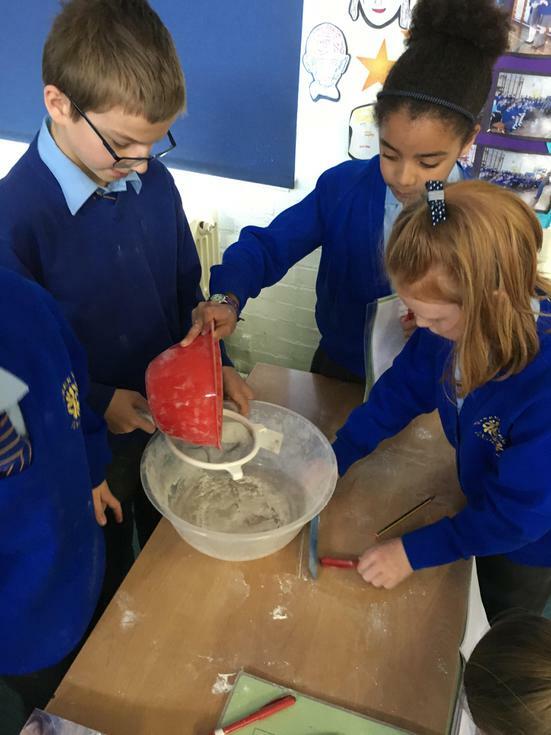 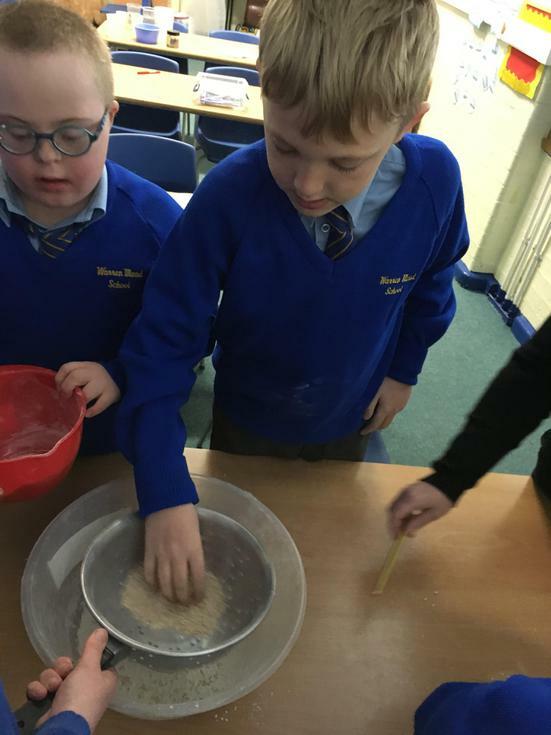 As historians we experienced hands on learning to design, plan, make and evaluate a recipe based on our understanding of what a Victorian diet might have been like. 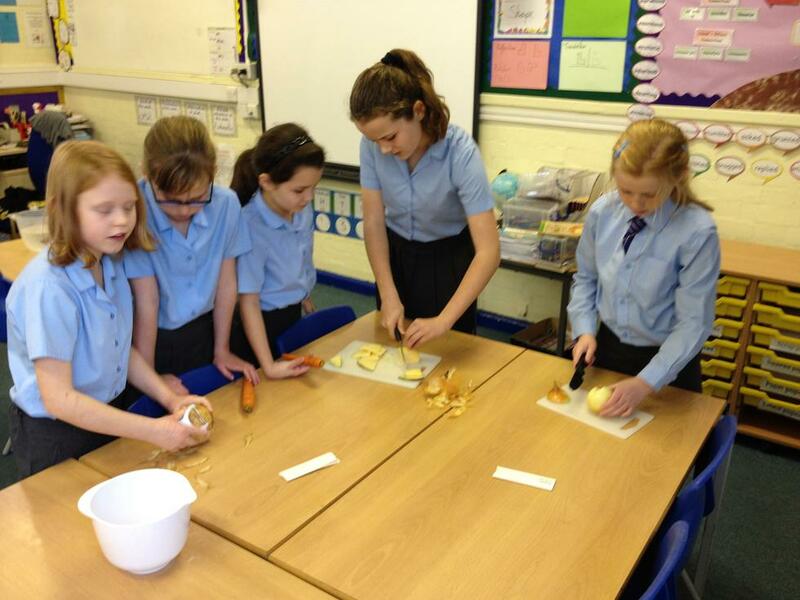 Seasonal root vegetables were used to make a hearty broth/soup and we also made some bread to go along with this. 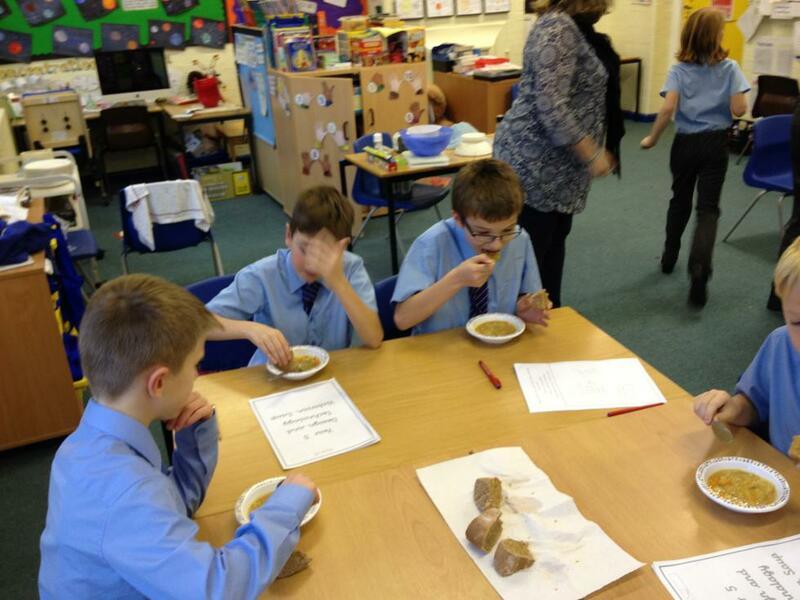 Our kneading skills definitely don't knead improving and our evaluations showed that it was souper broth. 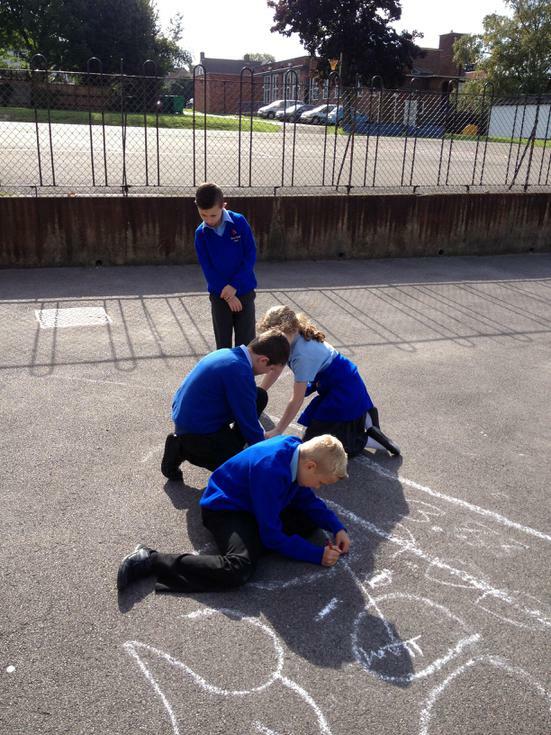 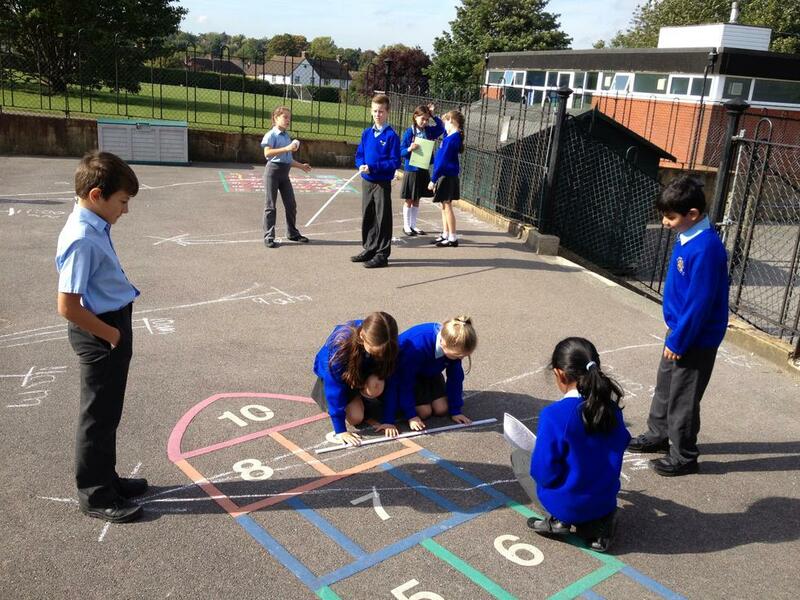 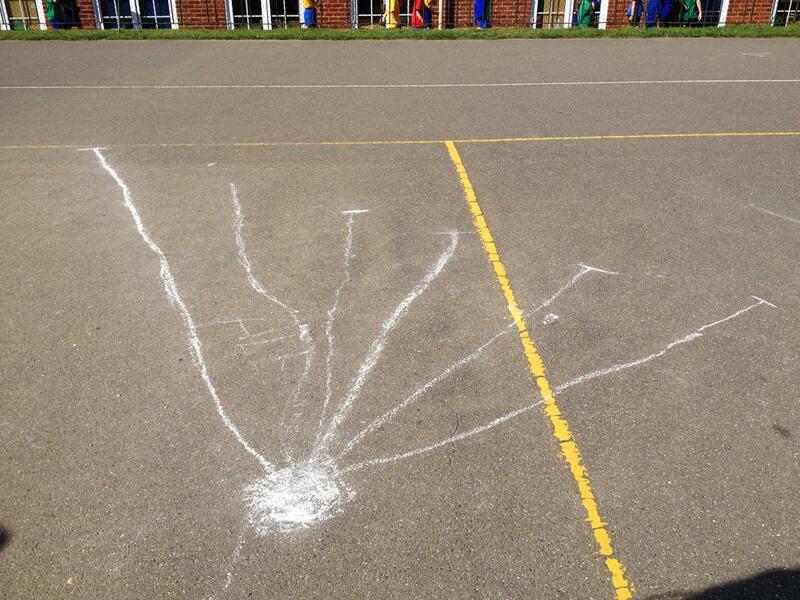 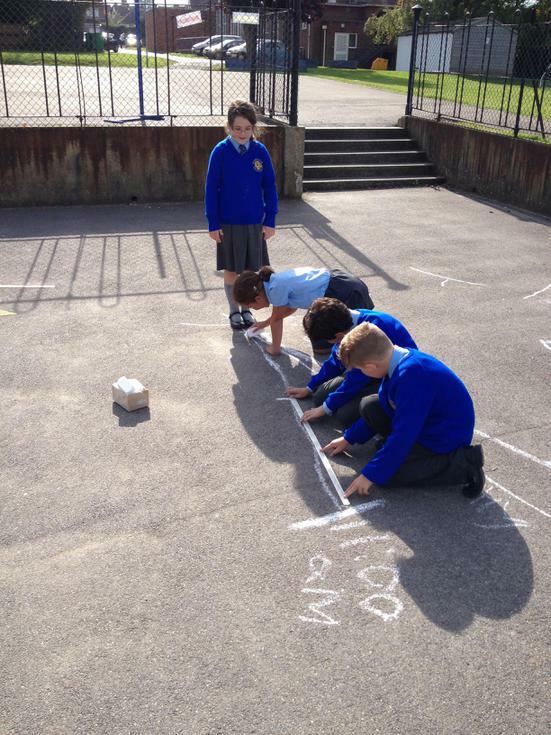 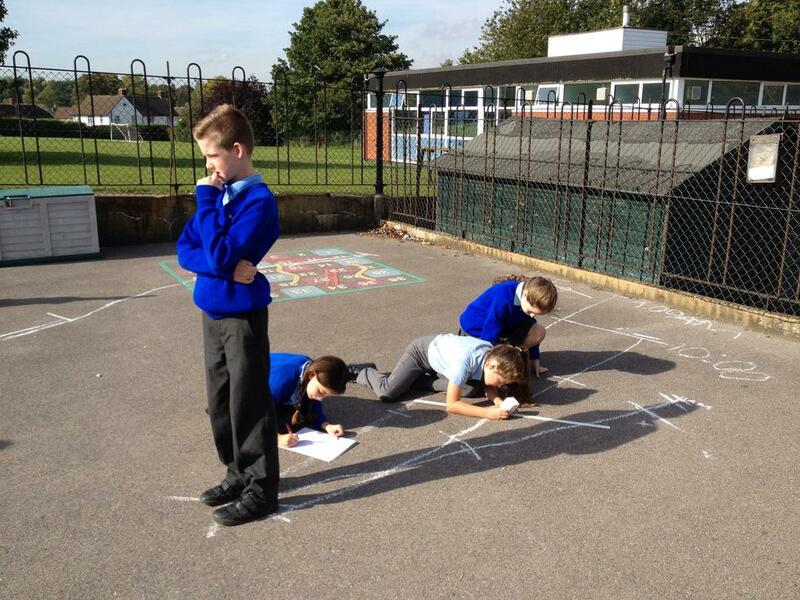 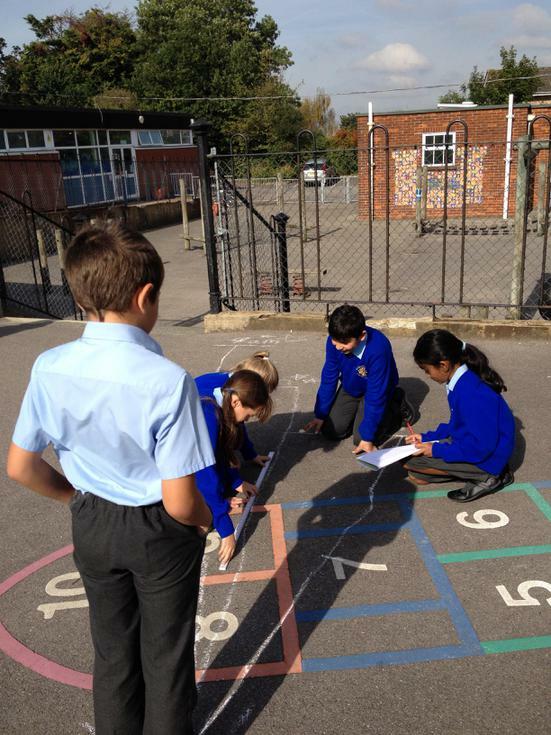 As scientists we took our learning outside and measured how our shadows change over the day. 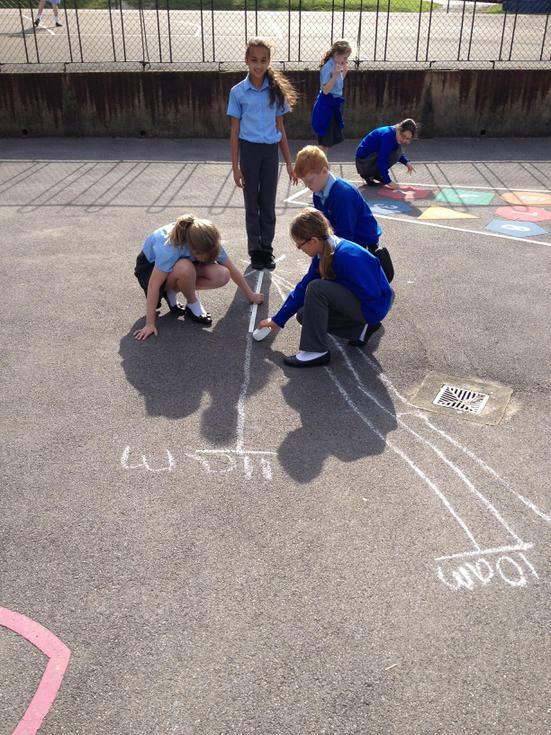 From this we could understand how The Earth rotated over the course of a day. 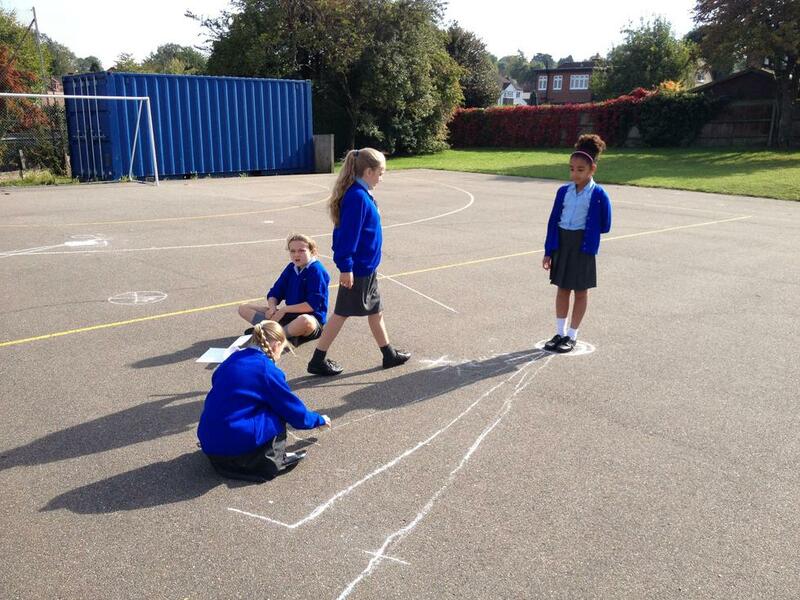 We then used the data to create line graphs to estimate our shadow lengths at the times we couldn’t measure. 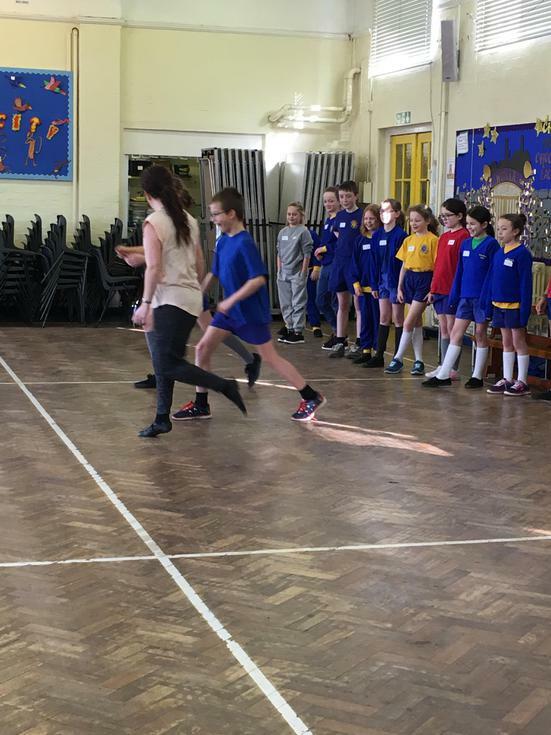 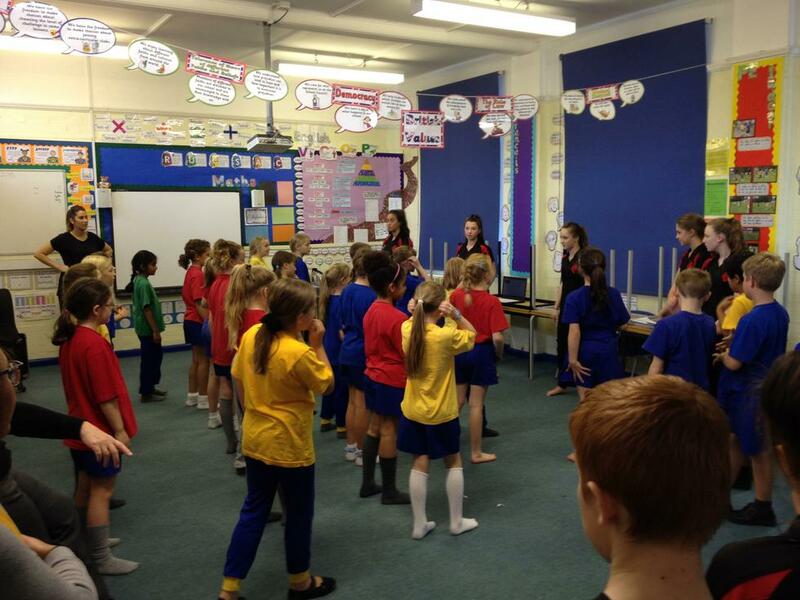 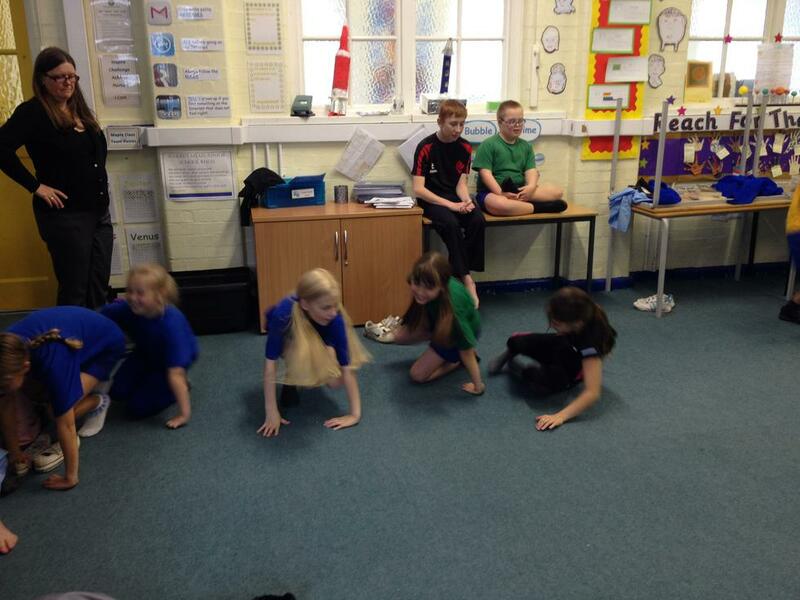 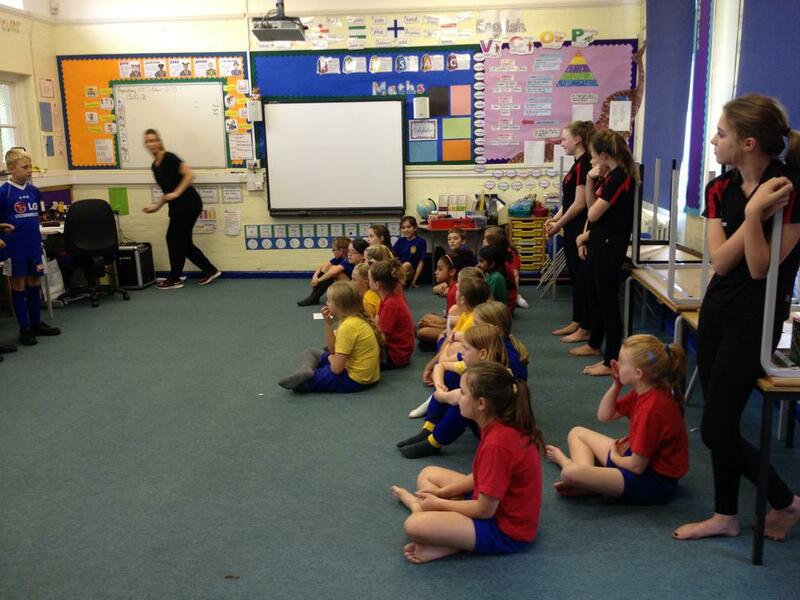 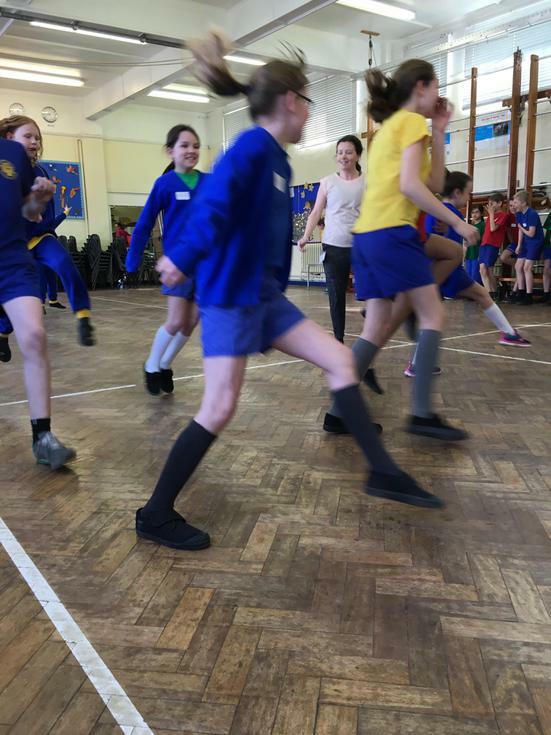 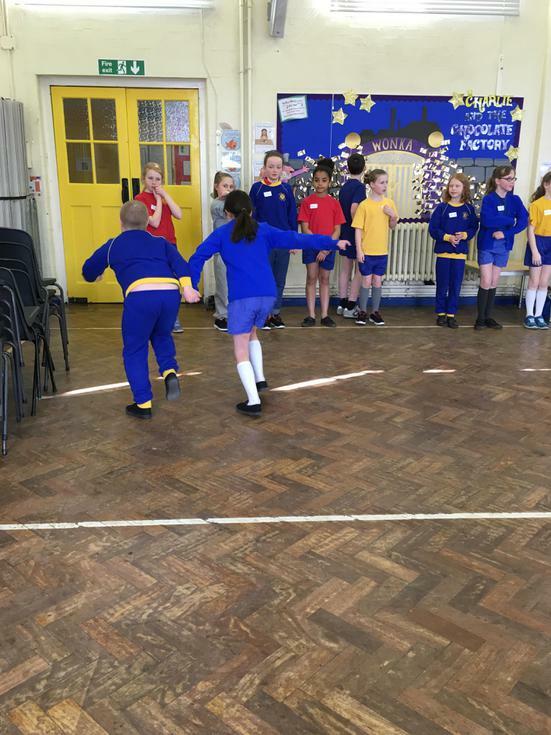 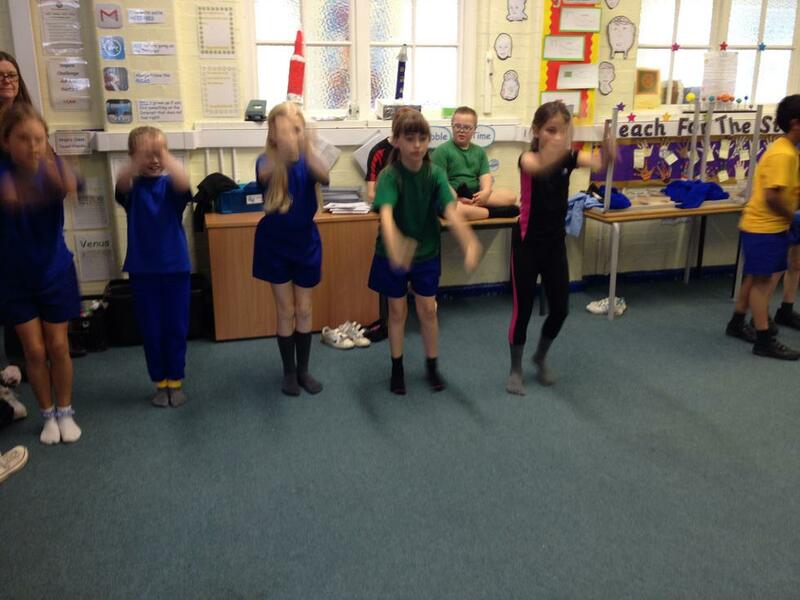 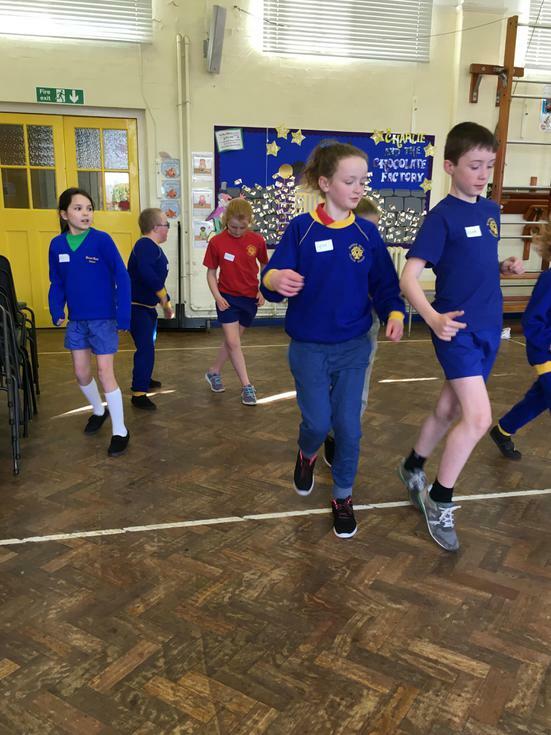 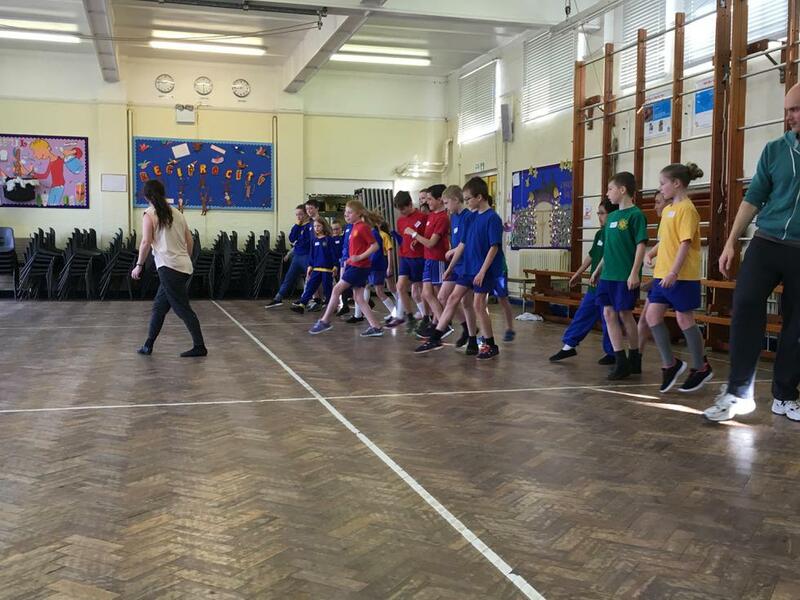 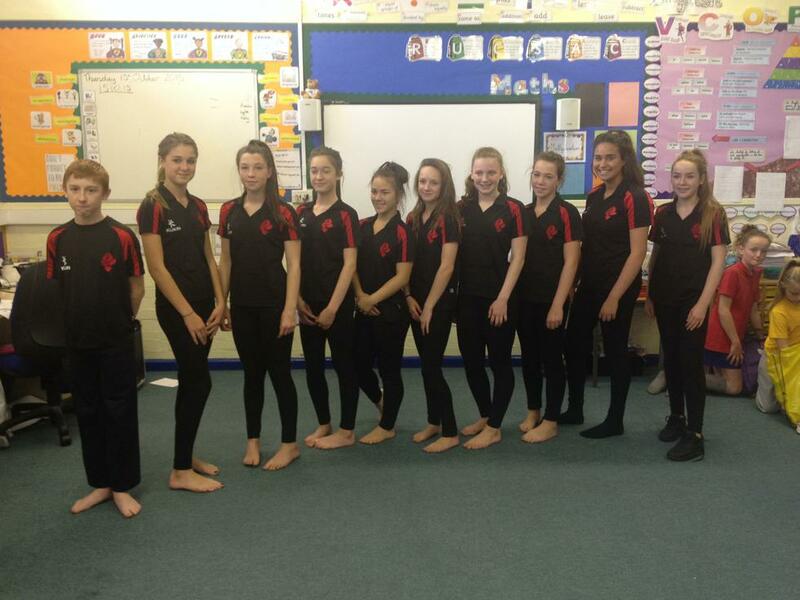 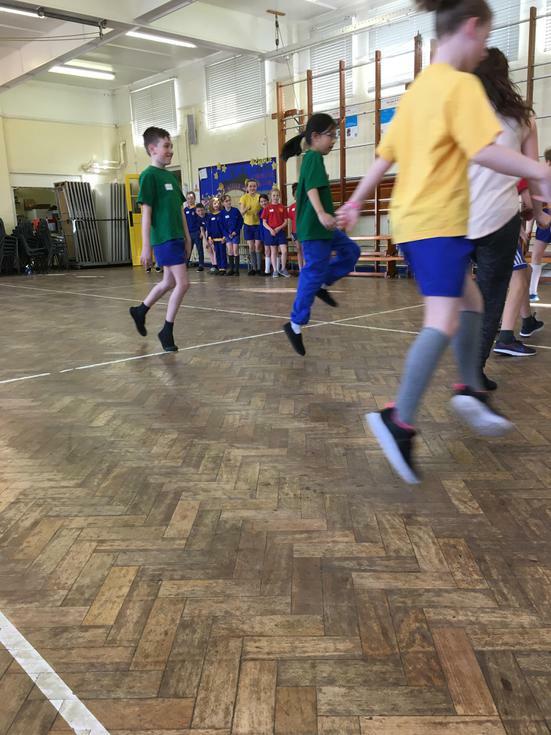 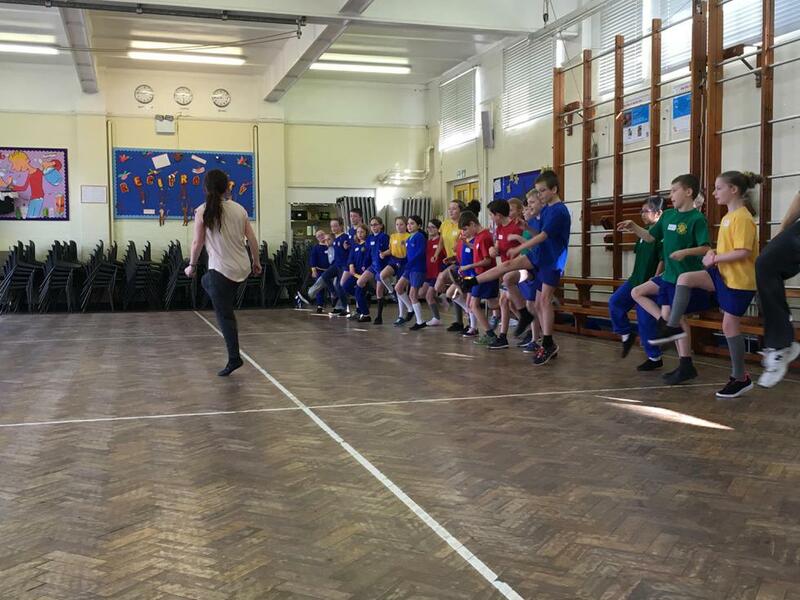 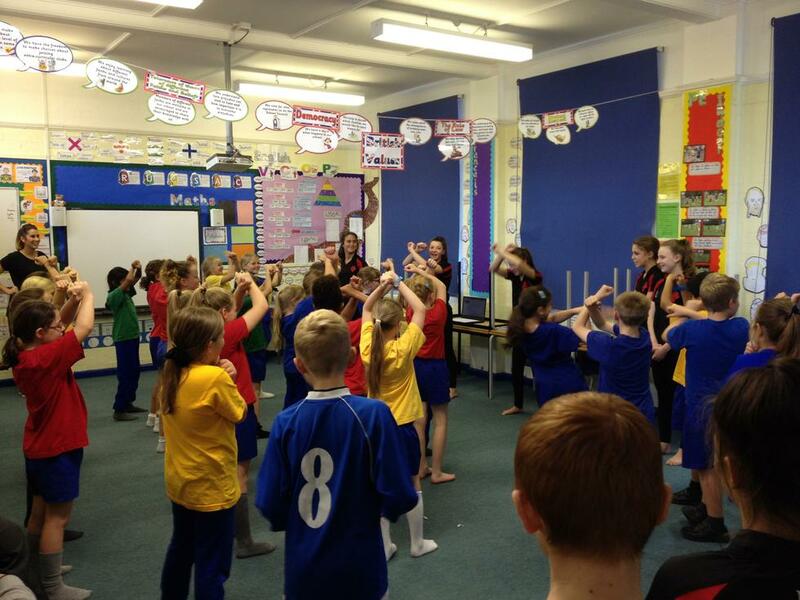 Dance students from The Beacon came in to run a dance workshop for some chosen Year 5s. 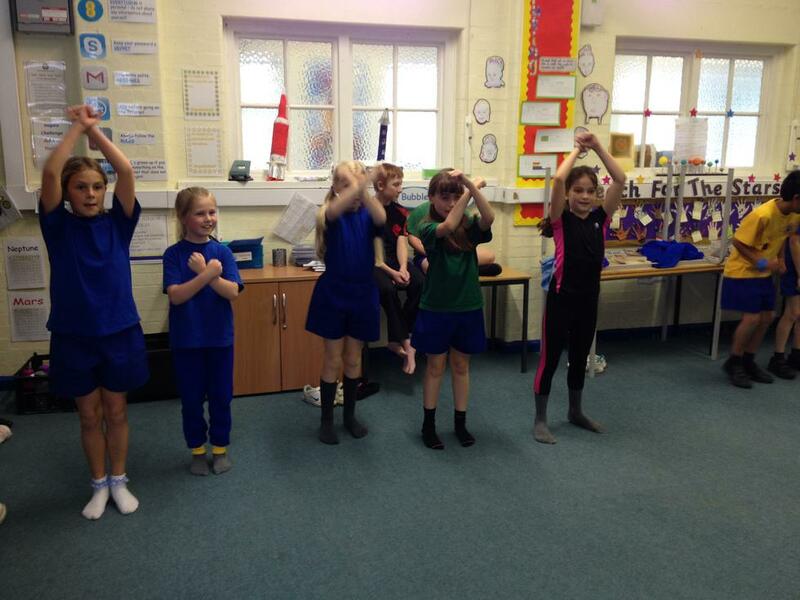 They taught the children a dance they had choreographed and then let them use their new learning to create a routine of their own. 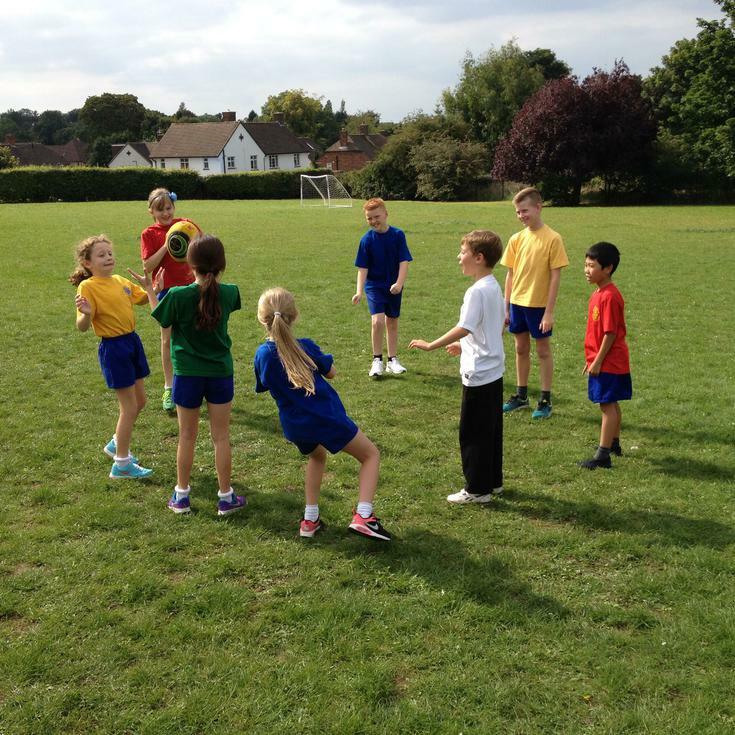 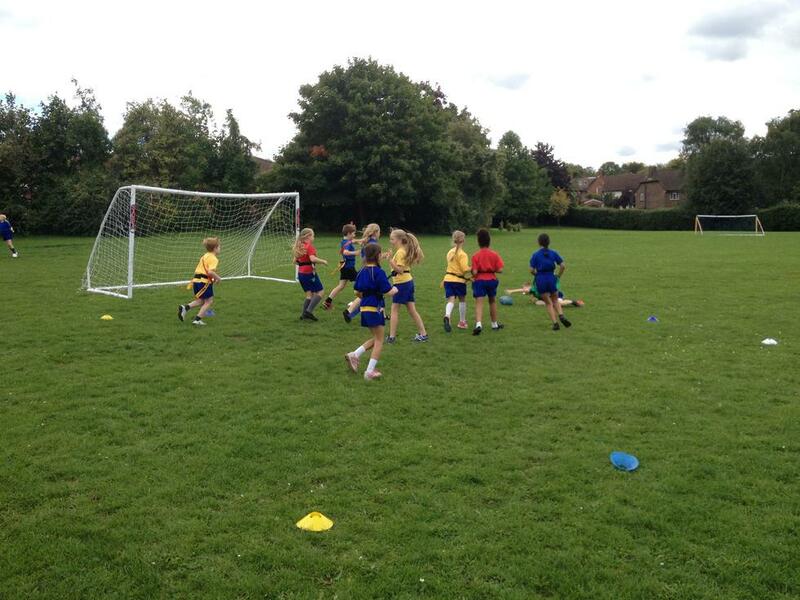 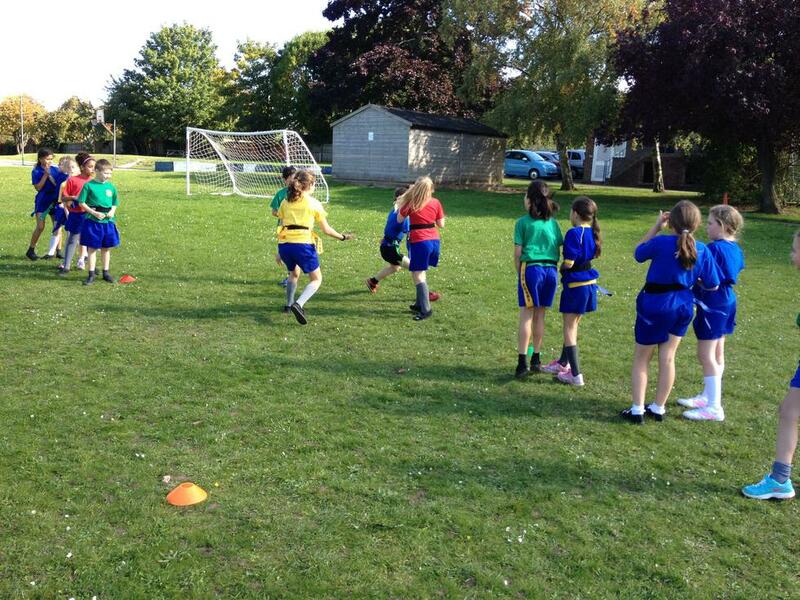 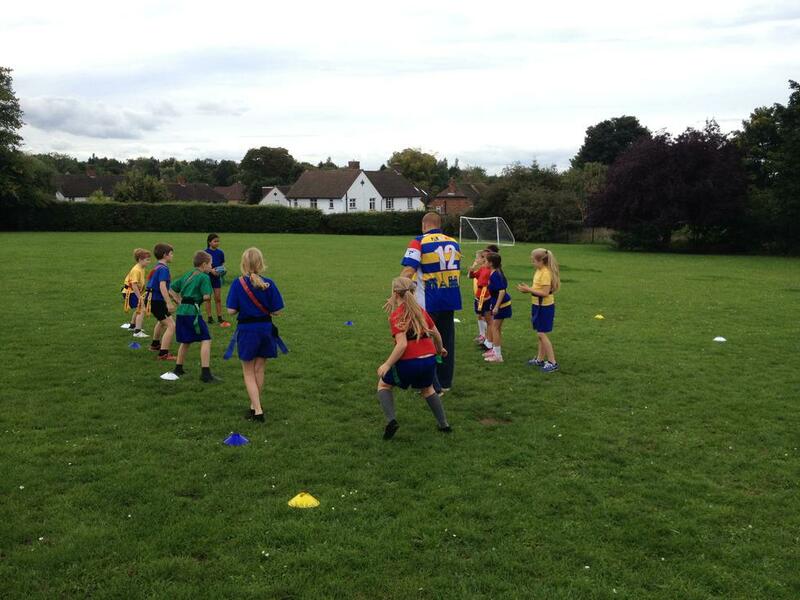 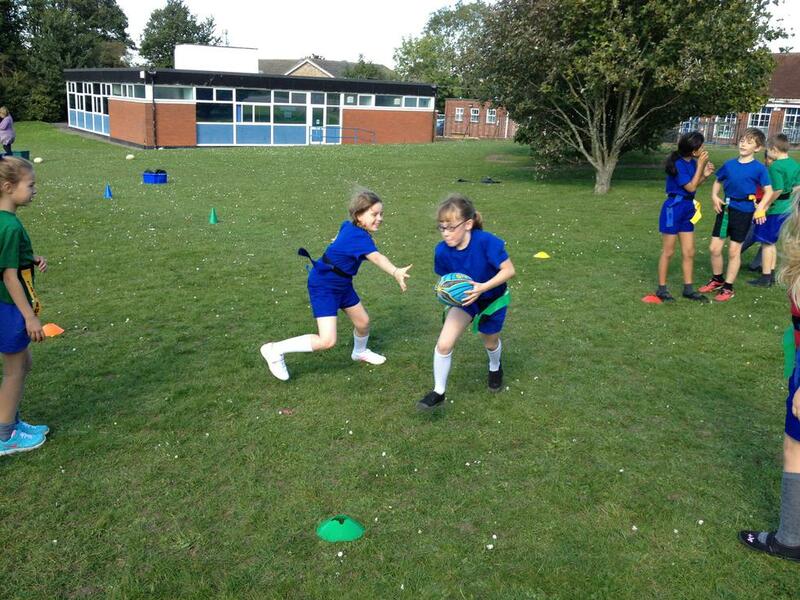 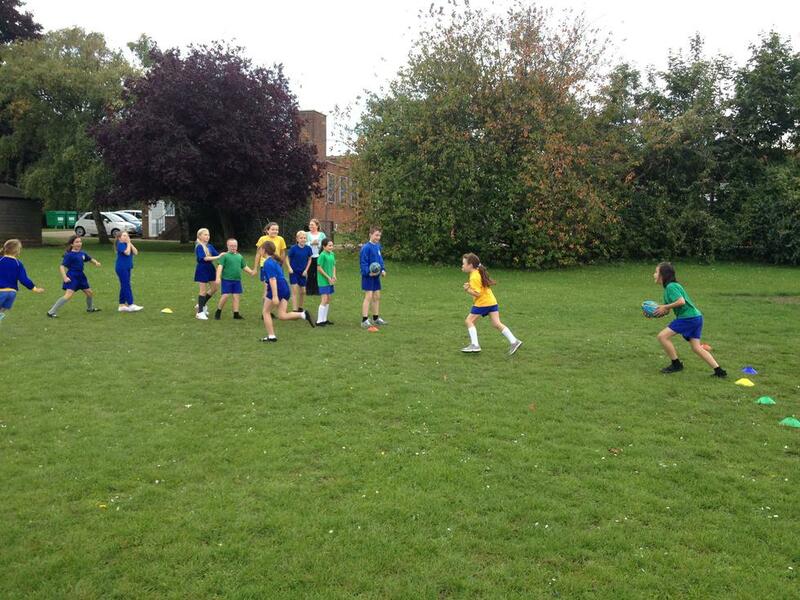 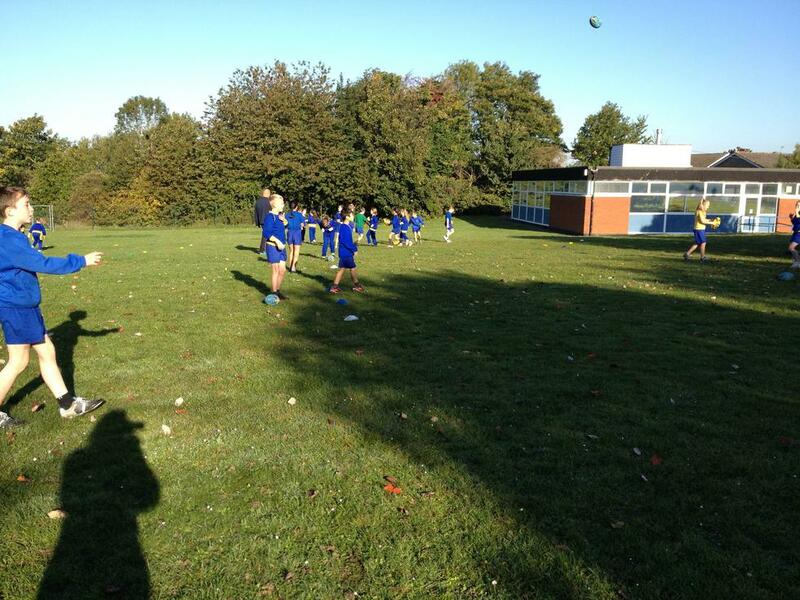 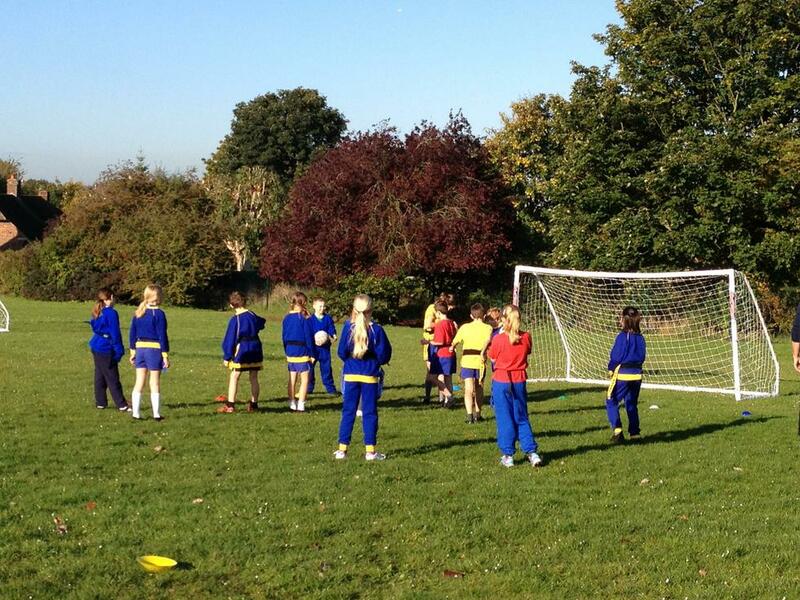 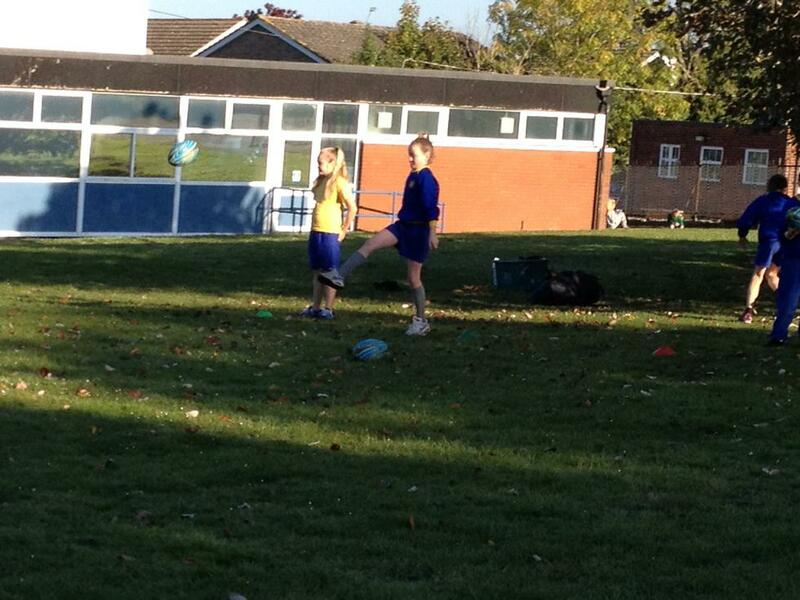 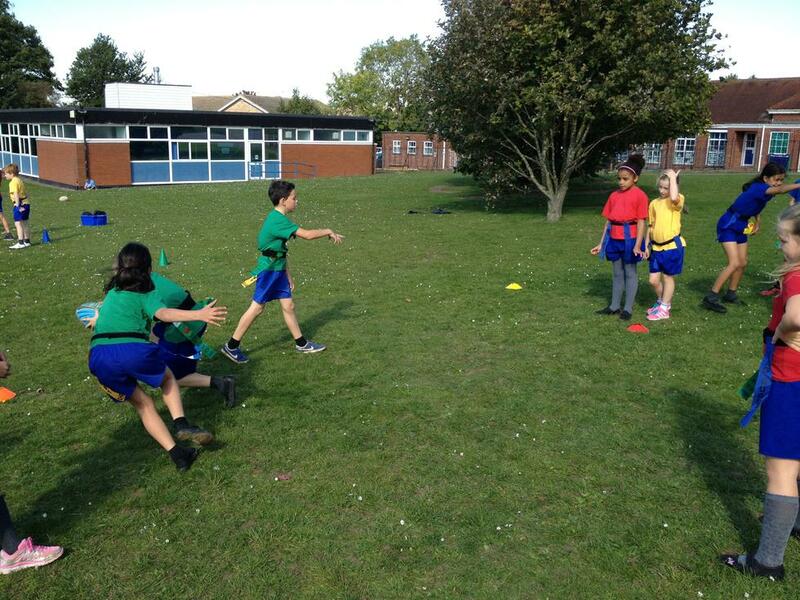 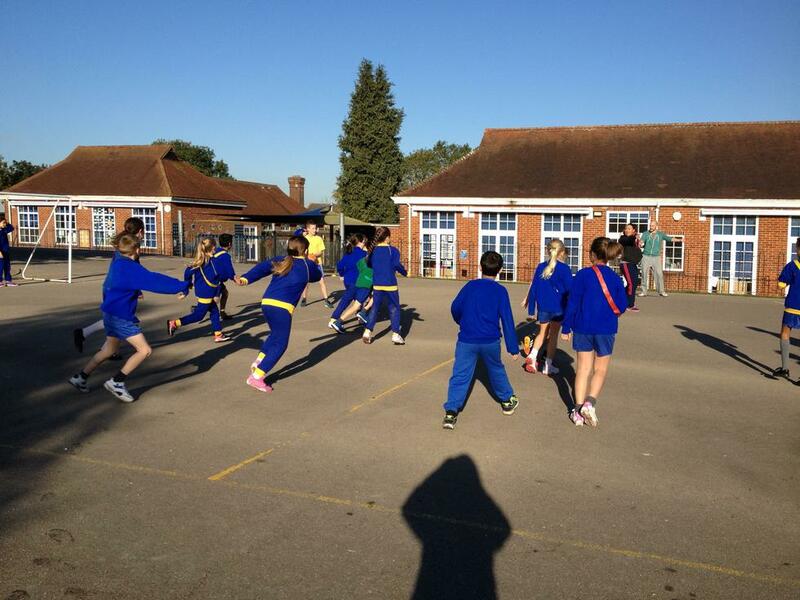 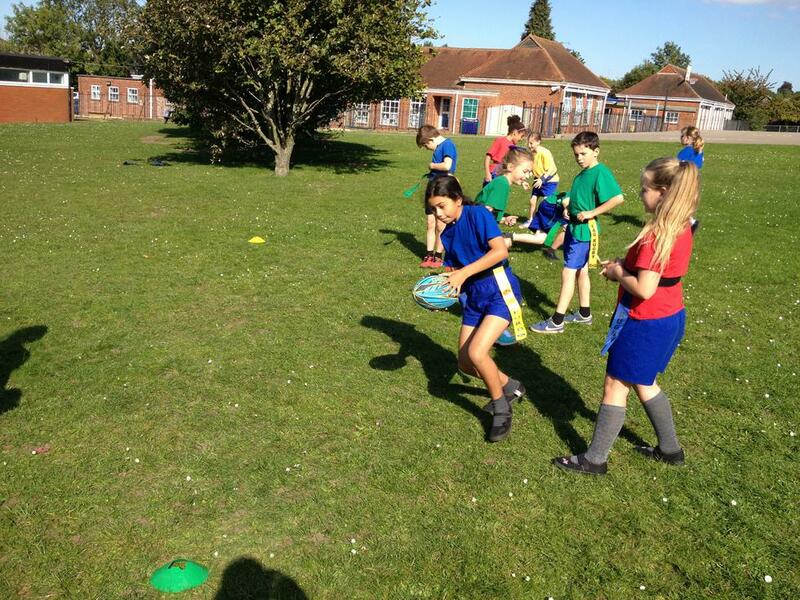 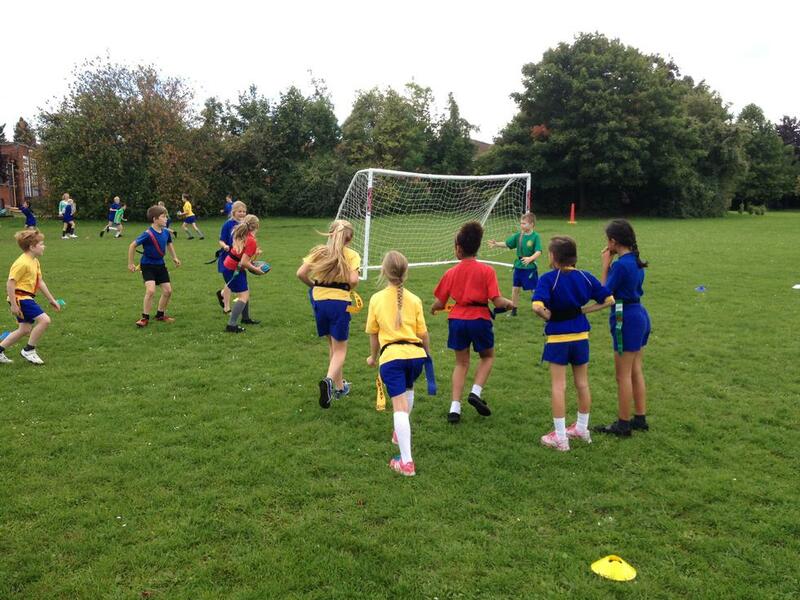 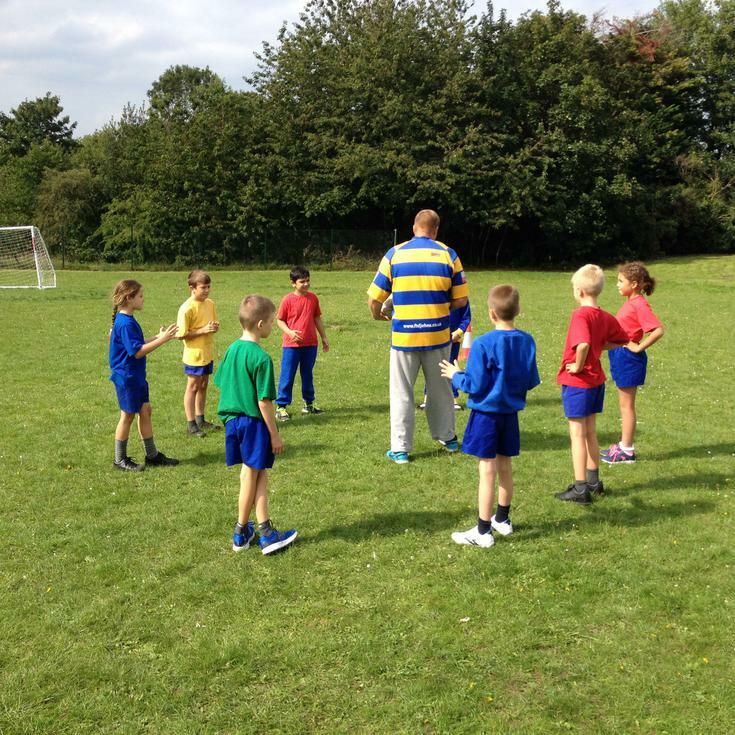 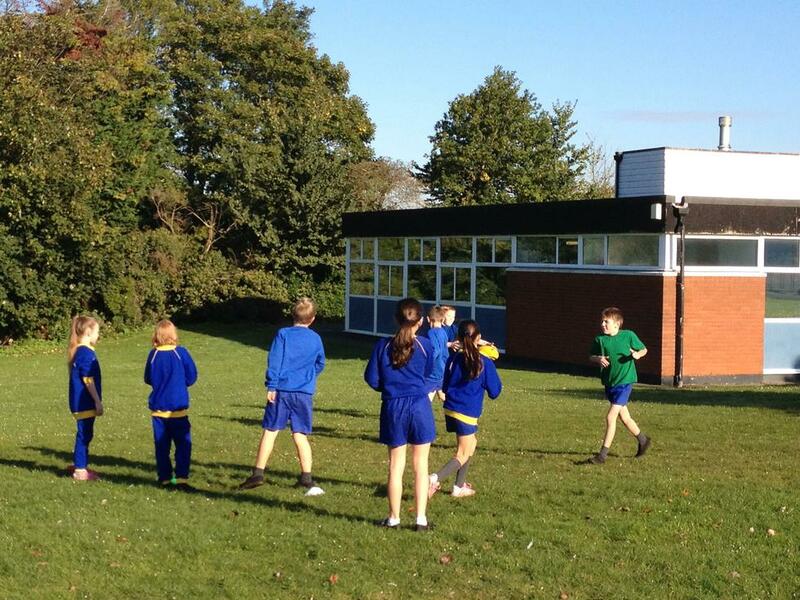 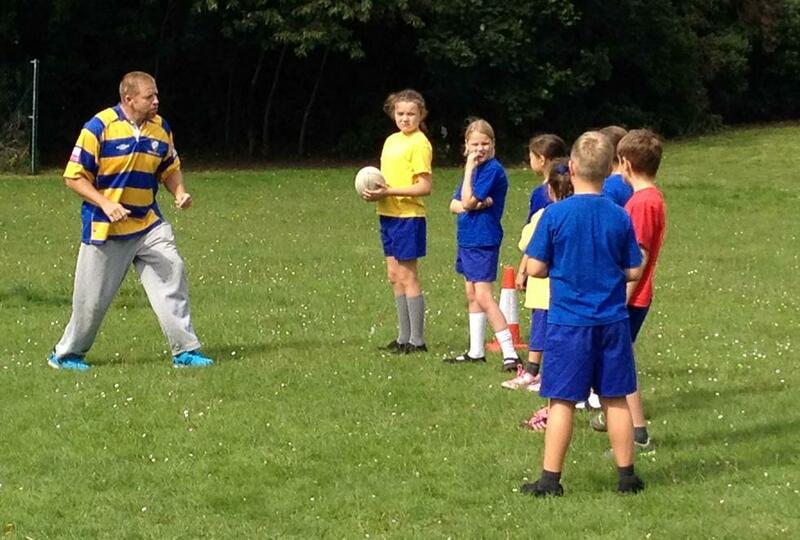 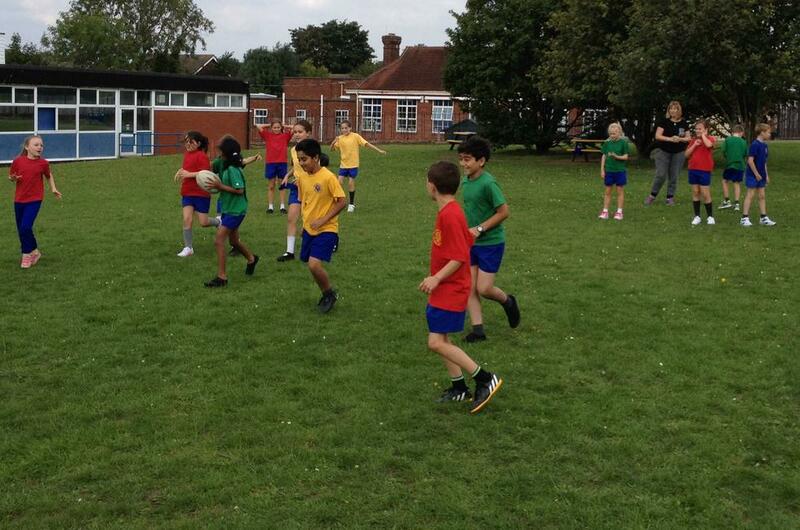 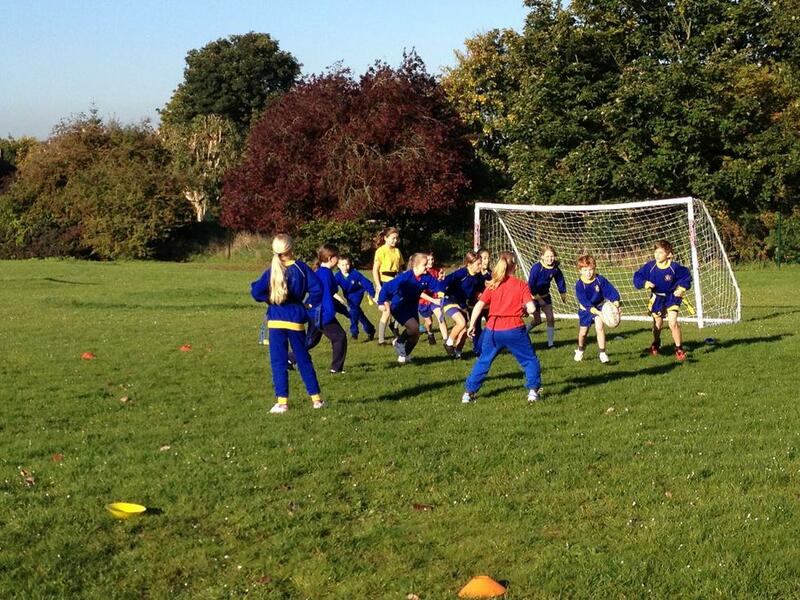 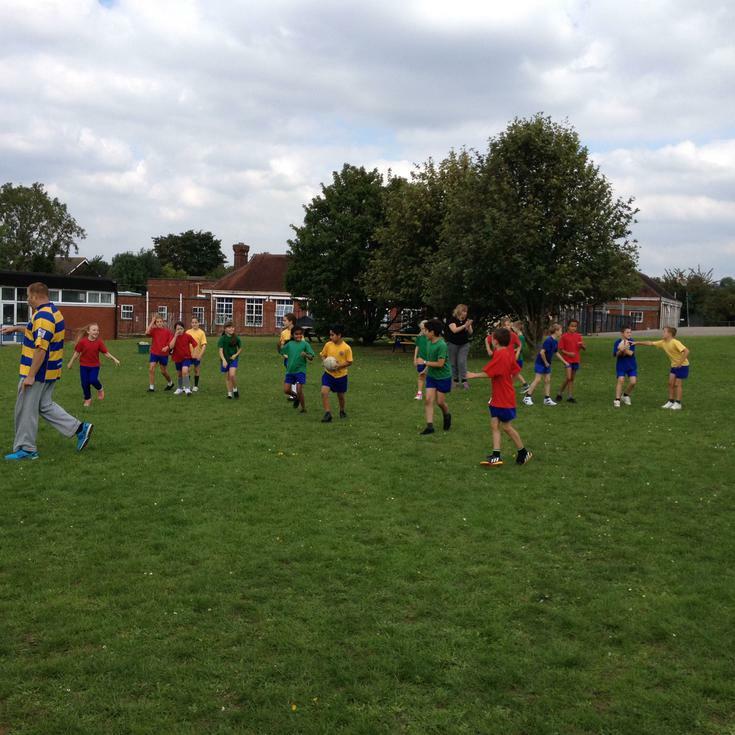 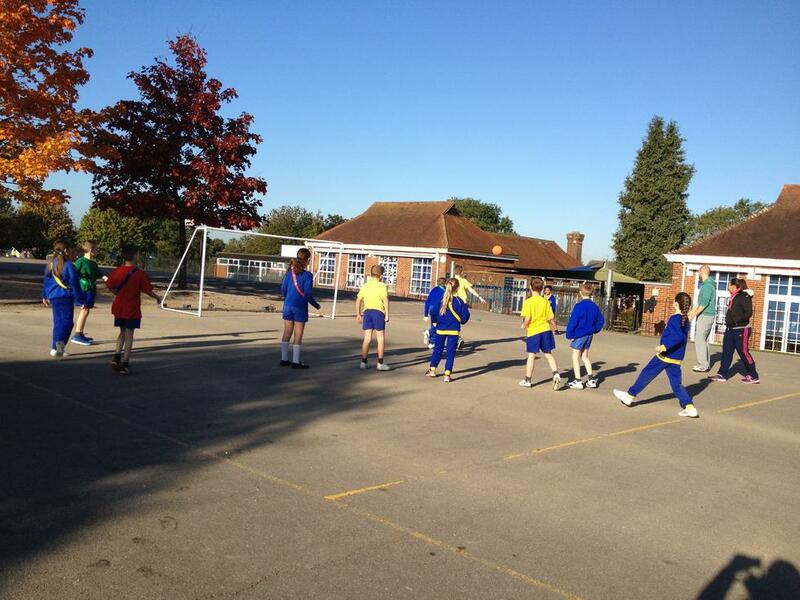 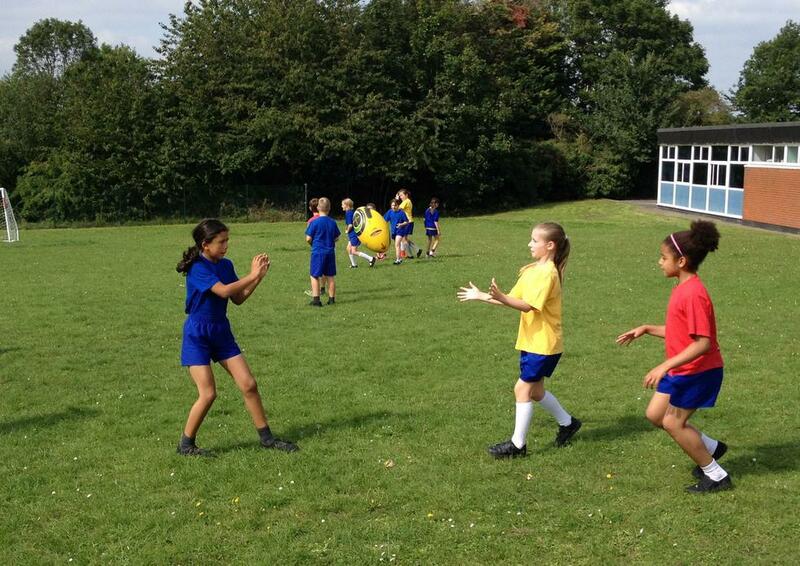 Year 5 have been lucky enough to have Chipstead RFC come in to teach our children how to play Tag Rugby. 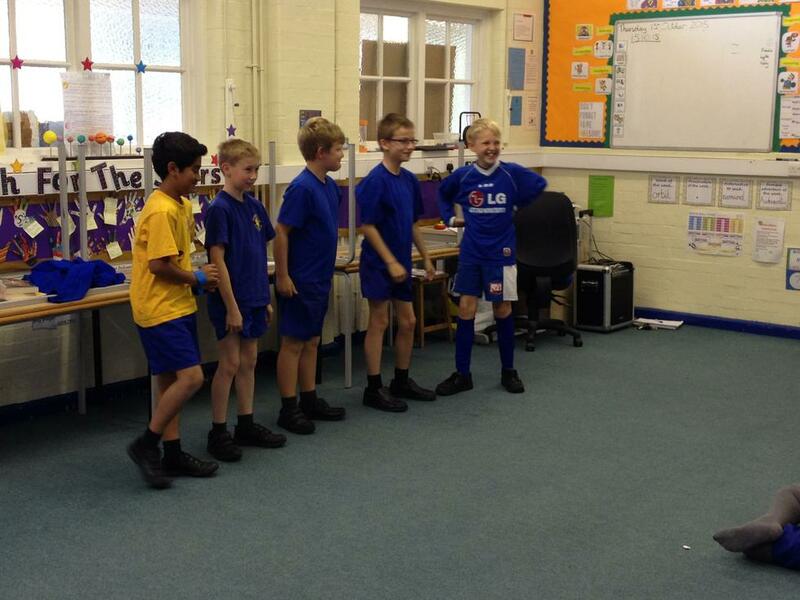 They did so well that we then formed a team and entered a local tournament.